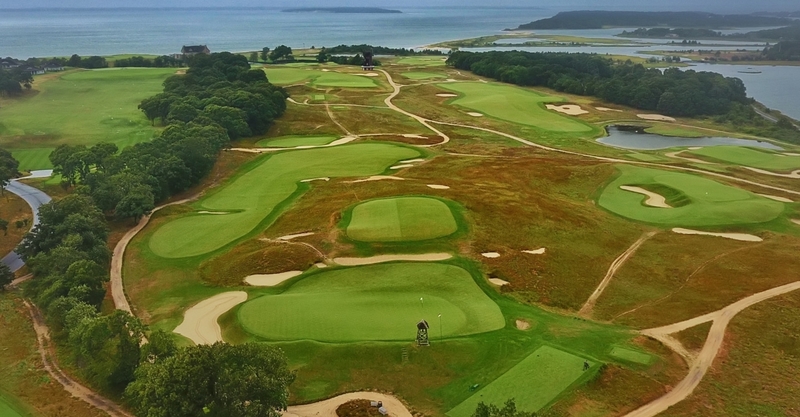 The ever-expanding resource for researching golf courses, including articles, photo tours, podcasts and video playlists. Forms of this inquiry arrive via phone, text and email on a regular basis. 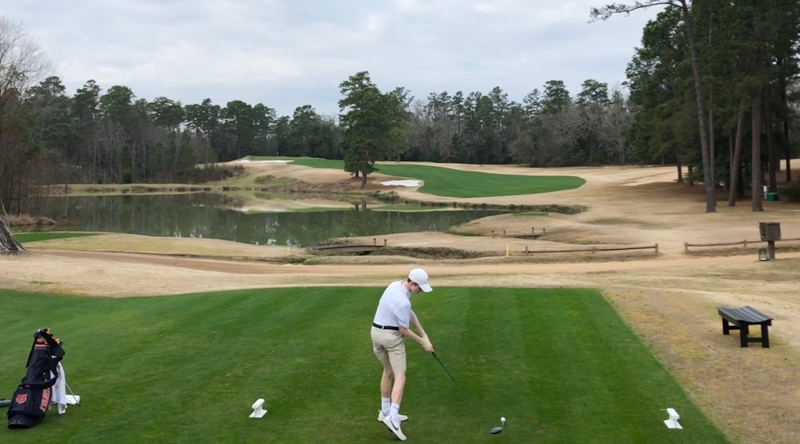 Given the seemingly endless sea of information about golf courses, some from sources more credible than others, it doesn’t surprise me that my buddies like to use me as a filter. After all, they know that course research is one of many things that I love about the game. So why waste their time doing legwork that I have probably already done? Truth be told, even if I don’t have an immediate answer, I will often put forth the effort to find one. 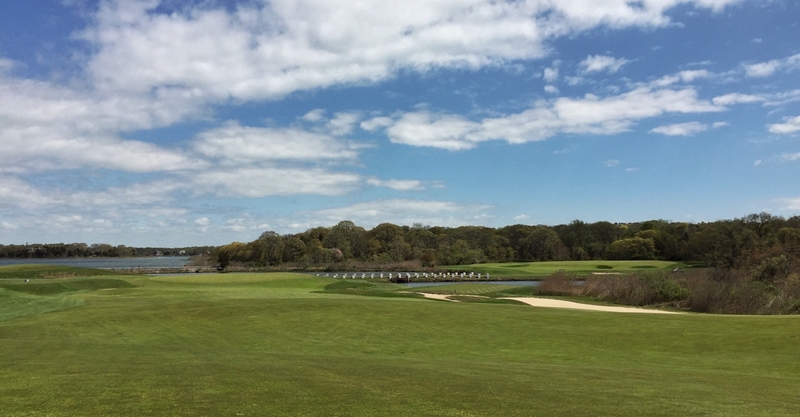 It would pain my geeky heart to learn that a friend had overpaid for lame golf while I remained silent. Such tragedies should be avoided at all costs. In the digital age, commentary, photos and videos have proliferated to the point that I was in need of a new tool to keep the best of it organized. 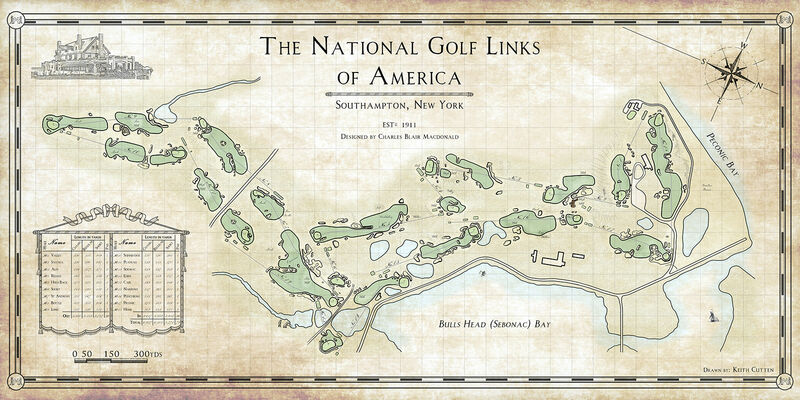 Thus, the GeekedOnGolf Global Guide was born. This interactive map has more than 1,000 pinned courses around the world for which I have found digital content. Each pin contains links to that content. A tip on using the map: in order for the hyperlinks in the pin notes to remain active, the map must be viewed in a browser (as opposed to viewing in the Google Maps app on your phone or tablet). Browser viewing can be done through the embed on this page, or by clicking here. This new tool allows me to continuously add and update new articles, photo tours, podcasts and videos. There are sources for course information that I consistently follow, and links are labeled with SOURCE-AUTHOR codes. A legend for those sources in below. Further, on my YouTube Channel, course video playlists are being added and updated regularly. Links to those playlists are provided in the map pins and labeled YT. Much golfing ground has already been covered, and I will carry on with the evolution of this resource. I hope that it is useful to you. Feel free to shoot me links and leads to add to the Guide. 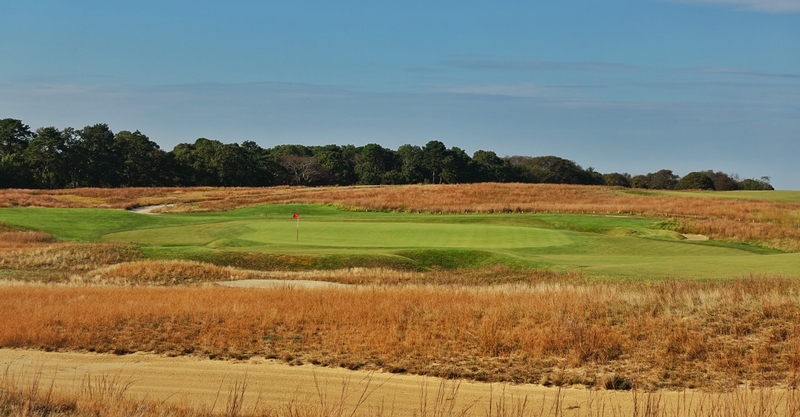 Just like golf, learning more about courses is much more fun with buddies. YT: YouTube playlists – Particularly keen on the video content coming out from Erik Anders Lang, No Laying Up, The Fried Egg and other new school media. TFE: The Fried Egg – The written, audio and video content that Andy and his crew are putting out is educational and entertaining. 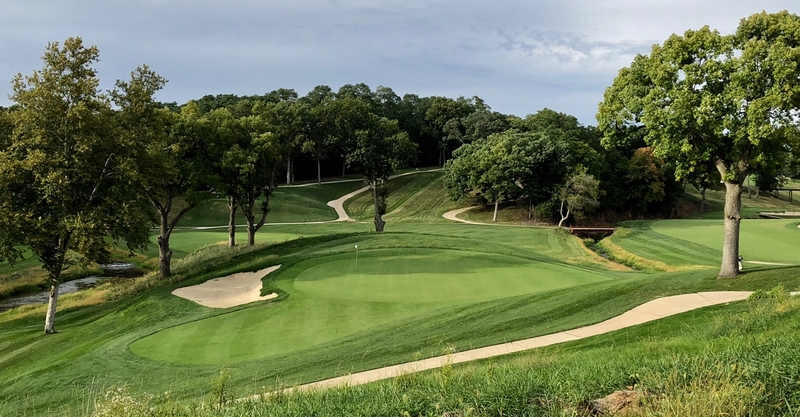 GCA: Golf Club Atlas – Ran is the architecture geeks’ OG, and his community continues to produce enlightening content. GL: Graylyn Loomis – Graylyn lived in Scotland and is now back in the U.S. writing for Links. 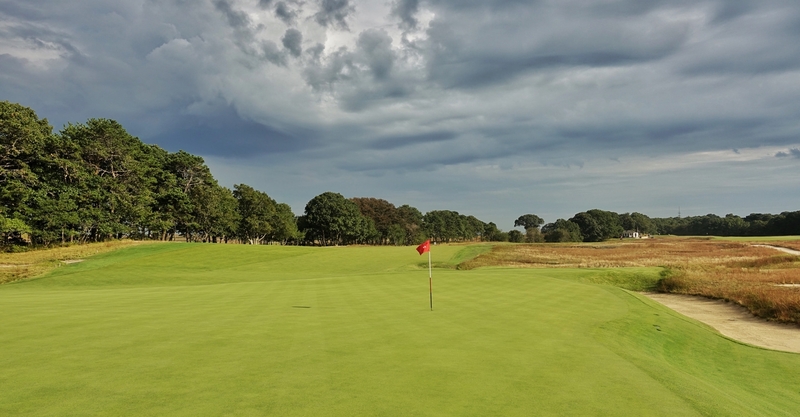 GT: Golf Tripper – Of the list chasers, I find Steve’s content to be the most resonant. 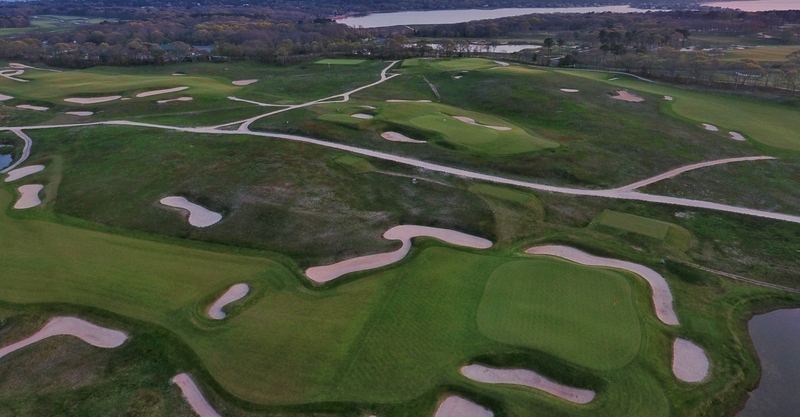 LM: Links Magazine – The Links crew has consistently been putting out good course content for a long time. 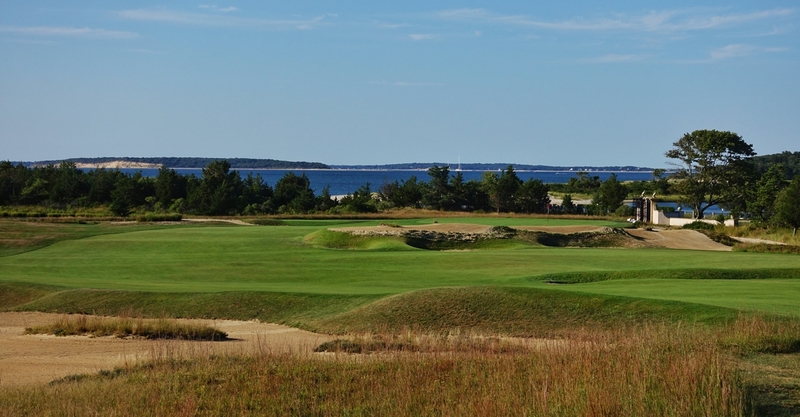 PG: Planet Golf – Darius is an insanely well traveled guy, giving his perspective particular weight for me. 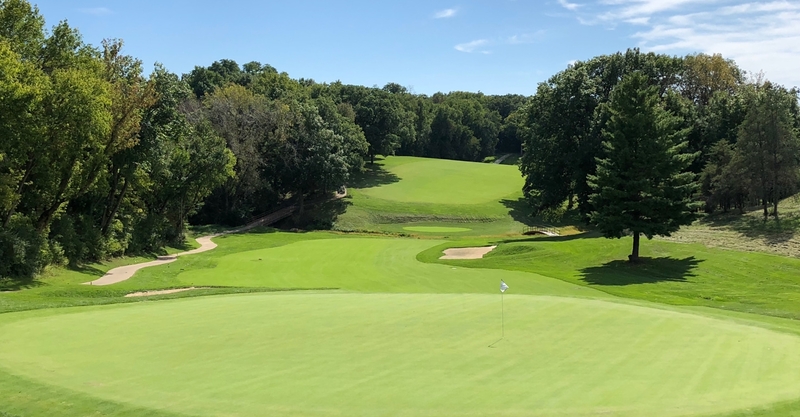 GCAM: Golf Course Architecture Magazine – Adam and his contributors keep up on industry news, while also putting out great course related articles. 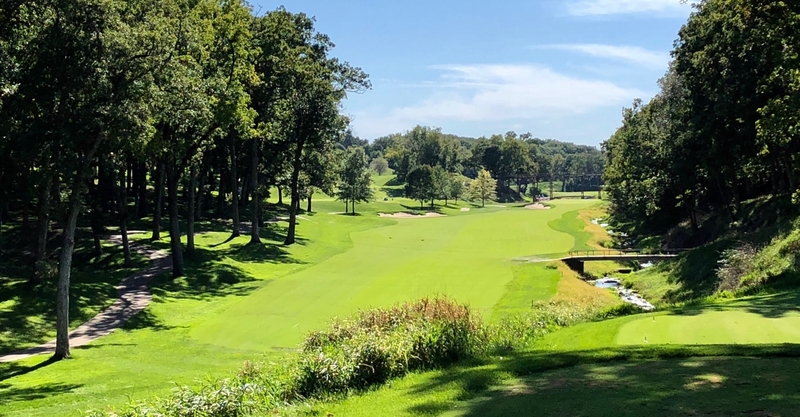 GCG: Golf Course Gurus – Billy is also very well traveled, especially in the Western U.S. His profiles contain robust photo collections. CM: Caddie Magazine – This crew from down under has great style. 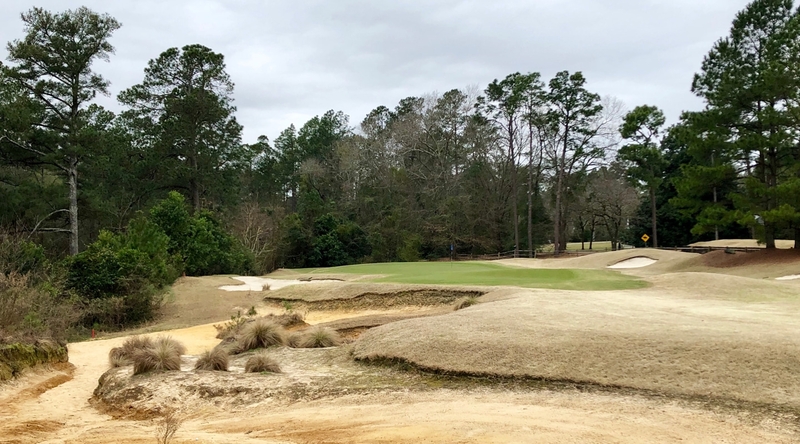 GA: Golf Advisor – With Brad and Matt leading the way, there has been an uptick in the content quality coming out of GA.
FTB: Feed The Ball – Derek is experienced and thoughtful, and his podcast is great listening for architecture geeks. 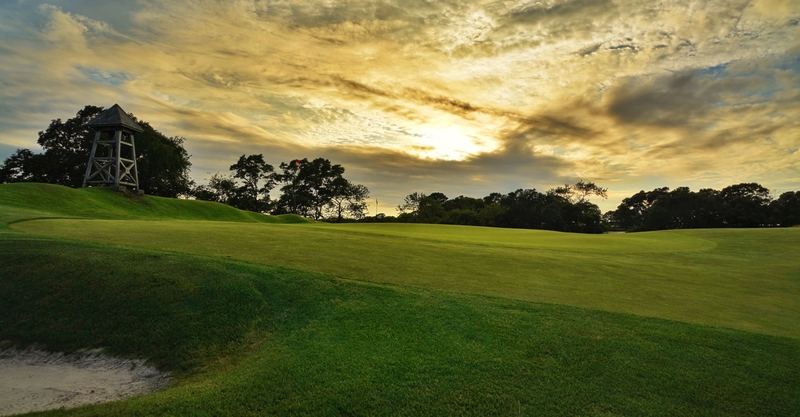 GAM: Golf Australia Magazine – The Aussie’s love their golf, and their coverage of courses is excellent. 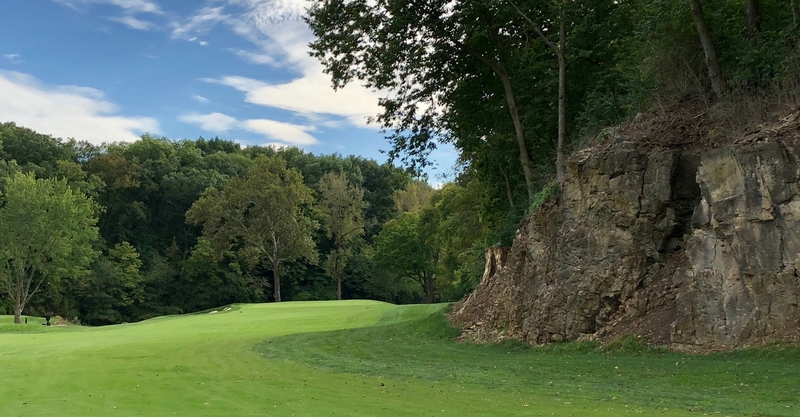 DR: Dimpled Rock Photography – Gary takes beautiful photos of beautiful courses, mostly in the U.S.
GLP: Gary Lisbon Photography – Ditto on the beauty, but with a focus on Australasia and the U.K. Please support the content creators by following their work and respecting their intellectual property. 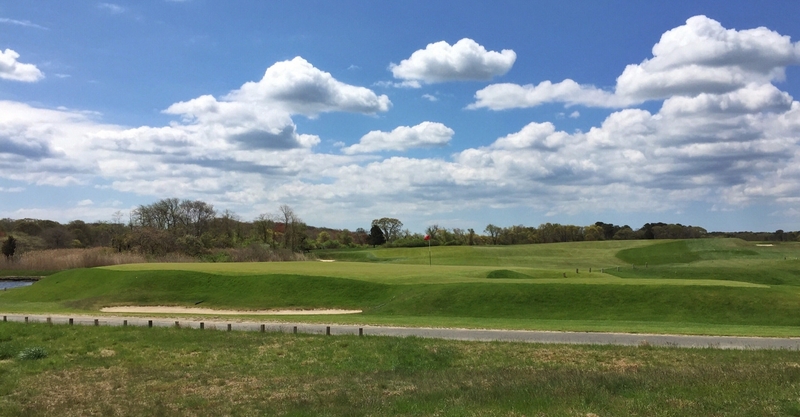 Categories: golf, golf course architecture, golf course tours, golf courses | Tags: geekedongolf, golf course architecture, golf course photography, golf course photos, golf course tours, jason way | Permalink. An in-depth profile of C.B. 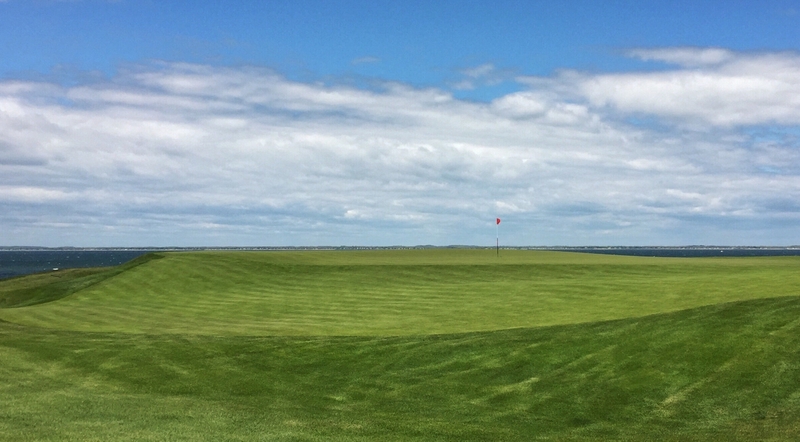 Macdonald’s National Golf Links of America and the design ideals it embodies. The National. Two words that, especially for devotees of classic architecture, hold so much meaning. 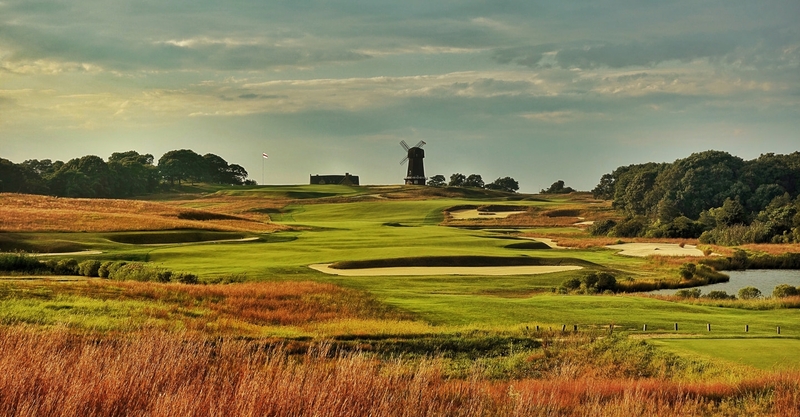 These words are not just shorthand for the club named National Golf Links of America, they carry the weight of one man’s incredibly lofty aspiration. An aspiration that history has proven to have been fulfilled. 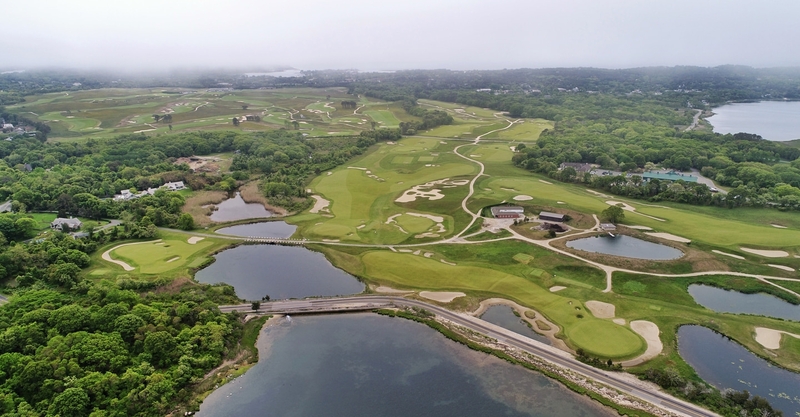 Charles Blair Macdonald set out to create the ideal links on Long Island after having spent years studying the great golf holes of the British Isles to ascertain what specifically made them great. With assistance from H.J. 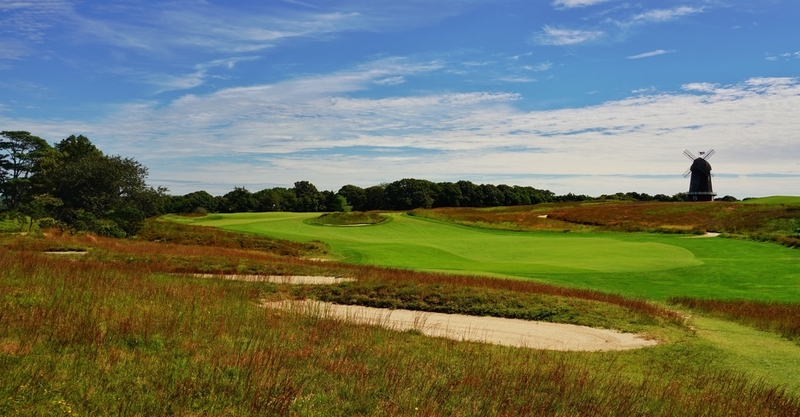 Whigham, Devereux Emmet, and most notably Seth Raynor, he then poured all of that greatness into one eighteen hole loop that opened for play in 1909. 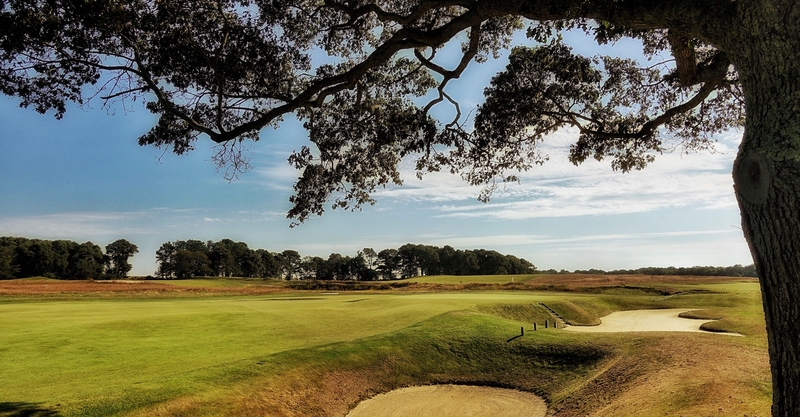 Perhaps Darwin was unwilling to pronounce the course the greatest back then, but at this point time, he would likely agree with the assertion that the greatness of the National is timeless. The combination of strategic design, beauty and fun transcend the fads of any particular era. 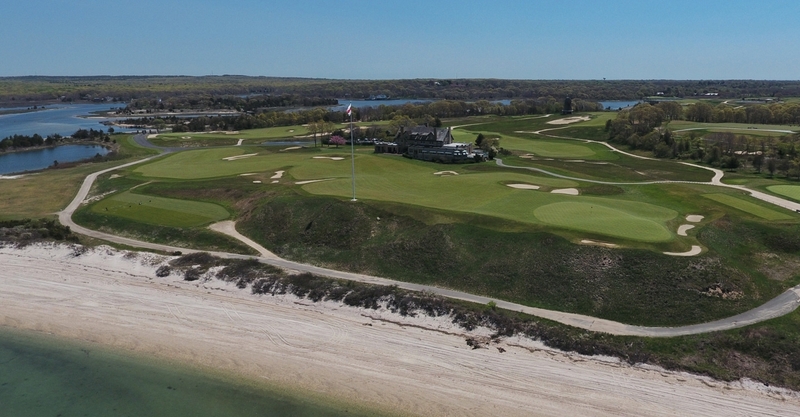 I tapped Jon Cavalier (@LinksGems) and Simon Haines (@Hainesy76) for this collaboration – the historical perspective of Macdonald and his contemporaries is complemented by Jon’s terrific photos, which make abundantly clear how beautifully the course is currently presented by Superintendent Bill Salinetti and his team. 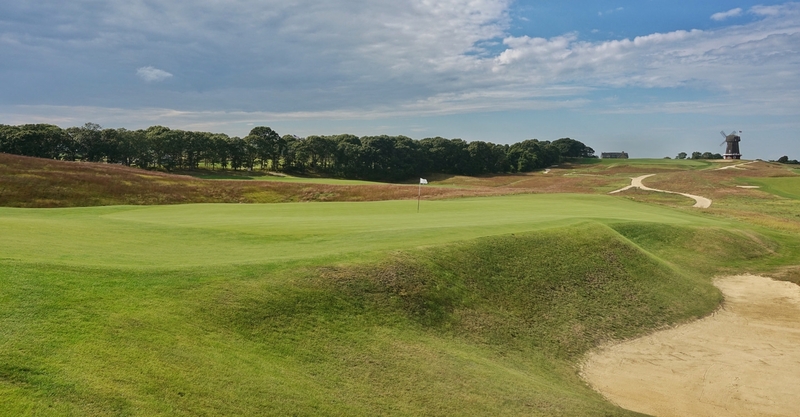 After a tour through all eighteen holes, I am confident that this contrast of past and present will prove the case that Charles Blair Macdonald’s ingenious approach to designing and building The National ensured that it would stand the test of time. Imagine a band holding a press conference at which they announce that they are headed into the studio to record their next album. They have studied the greatest songs in the history of music and have settled on the best tracks. They are not simply going to do an album of covers though. They have distilled the essence of greatness from each song and will create new songs that not only embody the essence of the originals, but also work together as a cohesive album. The cohesiveness is born of the adaptation of the songs to suit the current musical landscape while simultaneously harmonizing with each other. If the media and fans were even able to grasp such a plan, they would not likely believe that it would be possible to pull off. Essentially, that was exactly what C.B. 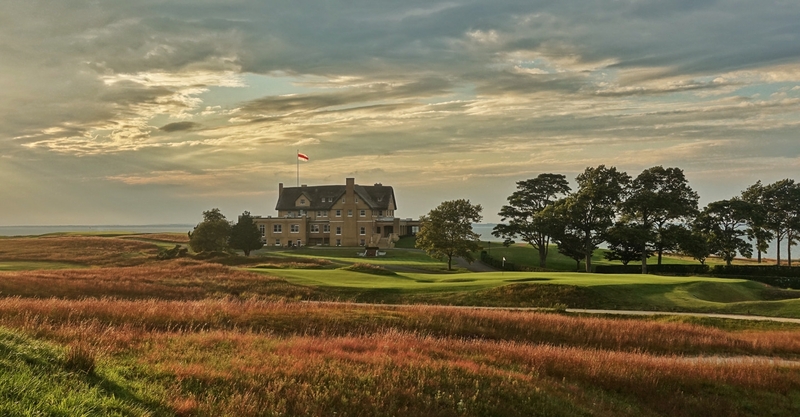 Macdonald told prospective Founding Members of National Golf Links of America he would do, and then he delivered. 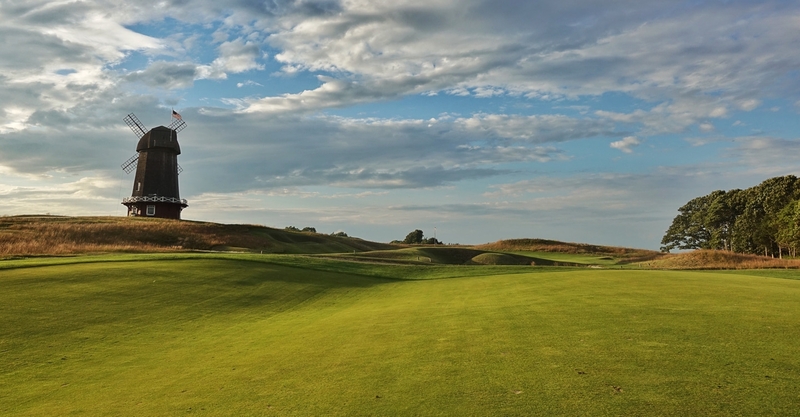 Drawing inspiration from his beloved links, Macdonald routed NGLA in a traditional out and back fashion. He found and used the best features of the land to deliver both beauty and variety. That variety is reflected in the sequence of holes – distance, direction, difficulty…consecutive holes are never repetitive. There is interest throughout the entire routing, but there is also a palpable slow build. 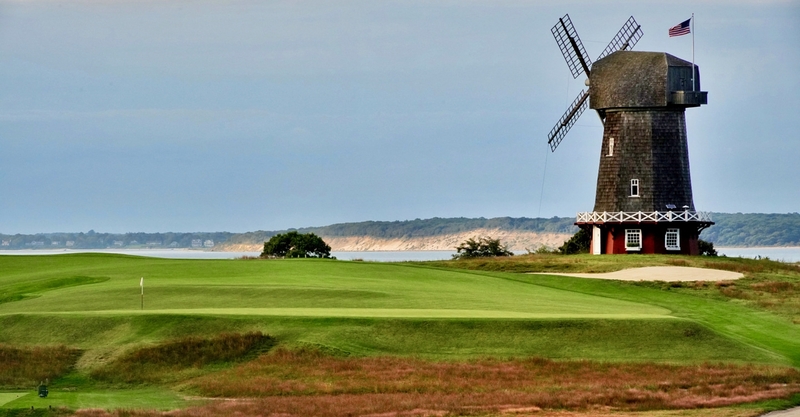 It starts on the first tee with views of the 18th green, Peconic Bay, the clubhouse and the windmill. 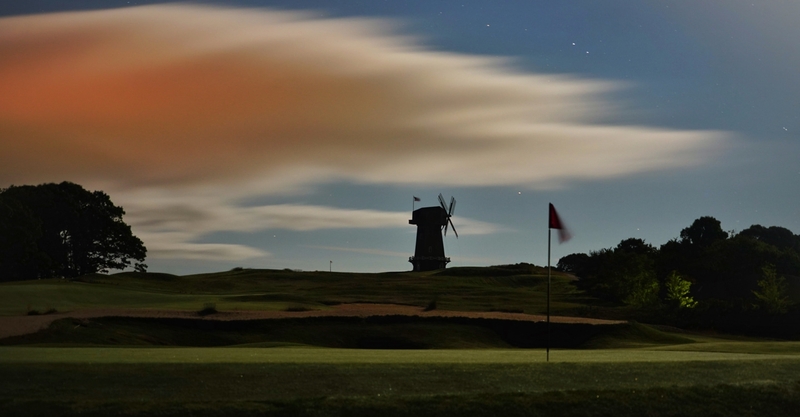 Players are then taken on a thrill ride over the Sahara and Alps hills with views of Bulls Head Bay, naturally drawing their attention to the all-world Redan 4th. The course then runs out on gentler land across the road, to the turn and back across the road. 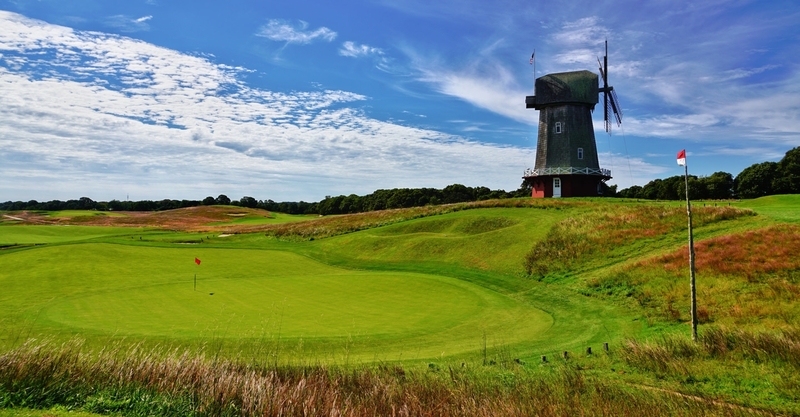 The first glimpse of the windmill on the hill comes on the 11th green, signaling the start of the adventure home. 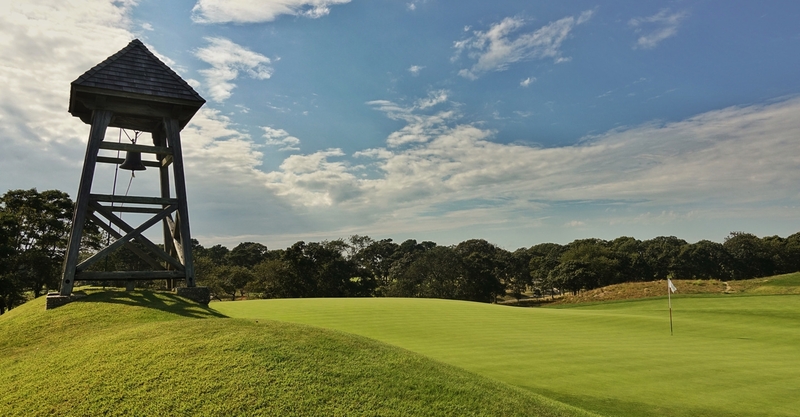 That iconic landmark grows bigger with every hole completed until players reach the cripplingly gorgeous home stretch, with the Eden and Cape hard against Bulls Head, the trek up and over the 16th fairway to the Punchbowl, and then the view from the 17th tee, which is as pretty as any in golf. 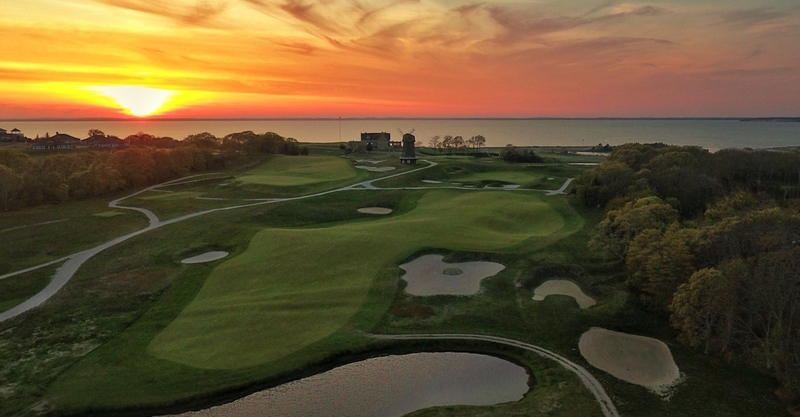 Finally and sadly, the climb from the gates up the 18th fairway, with the Jarvis Hunt clubhouse on the left and the wide expanse of Peconic Bay to the right, the breeze coming in off the water and if timed just right, the sun going down behind the sand. It is no wonder that a routing so clearly designed to conjure magic bewitches those fortunate enough to make the journey. This beautiful little opener gives the player an idea of what he will confront constantly during his round – choices. 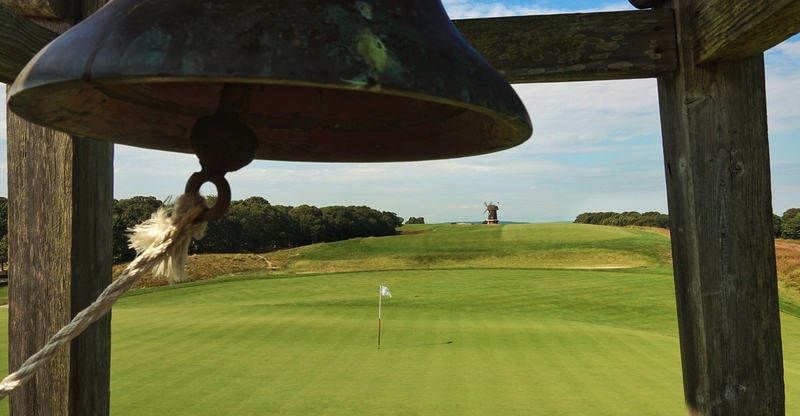 Playing left to right, the choice of tee shot could be anything from a mid-iron to driver. 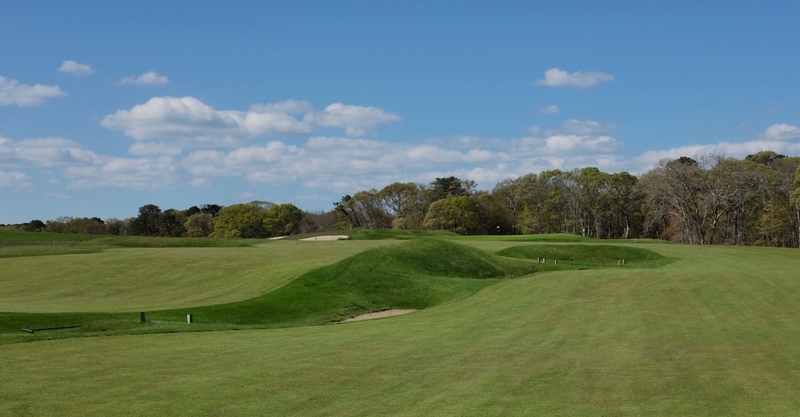 Overly timid or indifferent tee shots will catch a string of bunkers laid out short of the fairway. 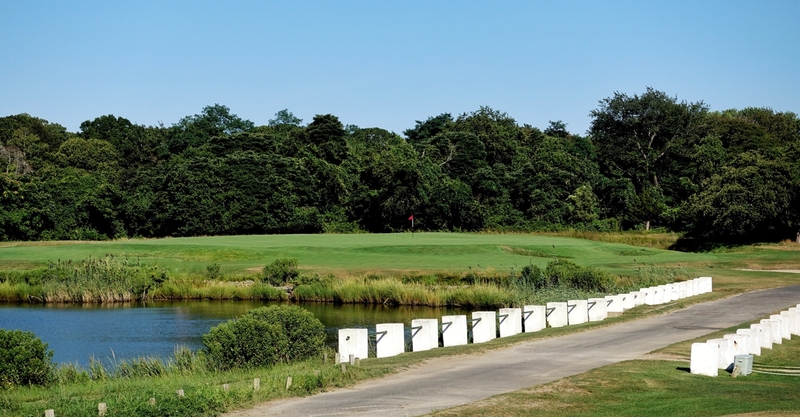 The carry to the left is significantly farther than it appears from the tee. 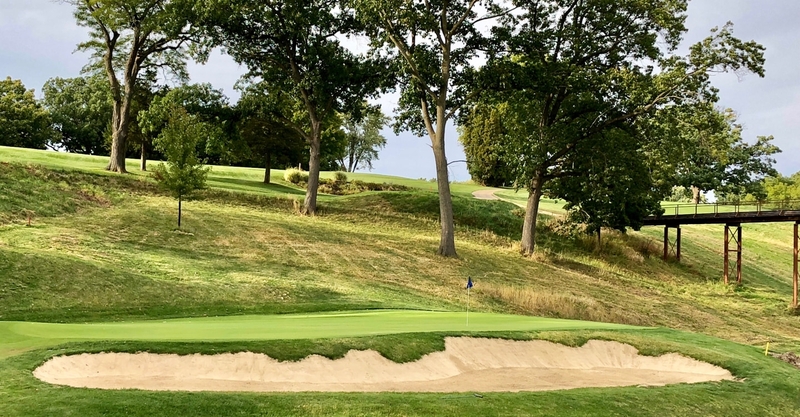 While the aggressive line makes the green reachable for longer players, these bunkers will extract a severe price from an overly ambitious tee-shot hit by an overly confident player. 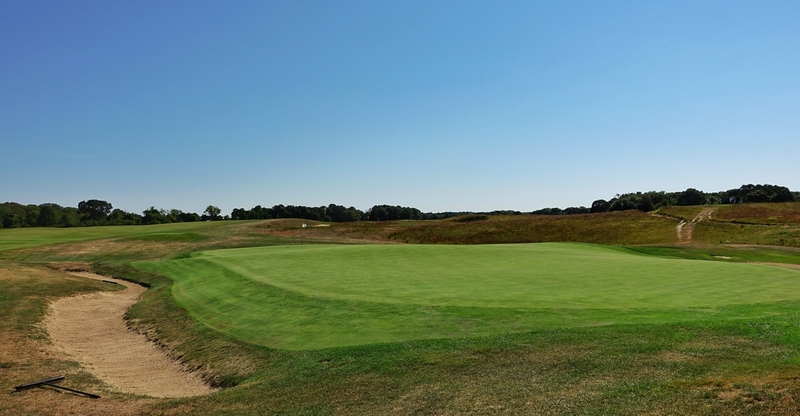 The green is elevated, obscuring parts of the putting surface and surrounding area from view on the approach. A severe false front will repel shots that come up short. 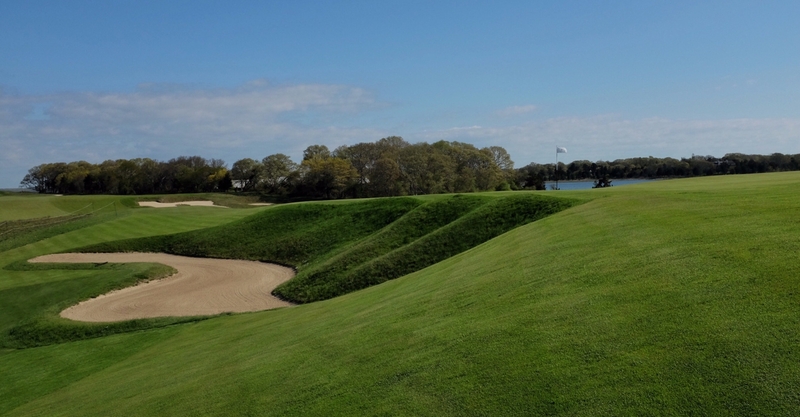 Balls missed left will find deep bunkers, while those right will encounter a series of random humps and mounds. 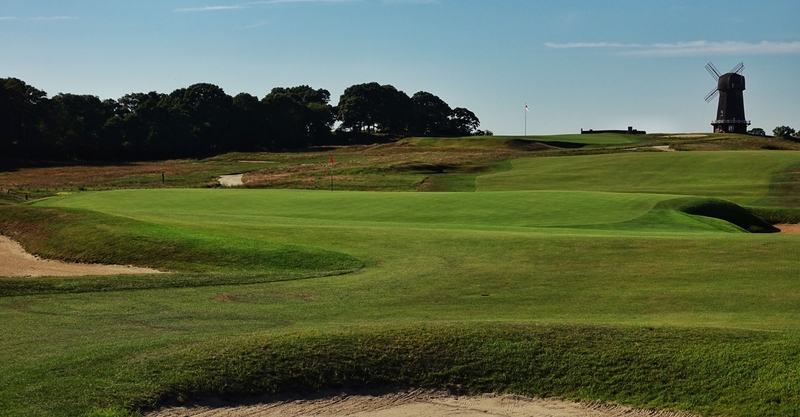 The first green is rife with undulations and ridges, placing added importance on an accurate approach. 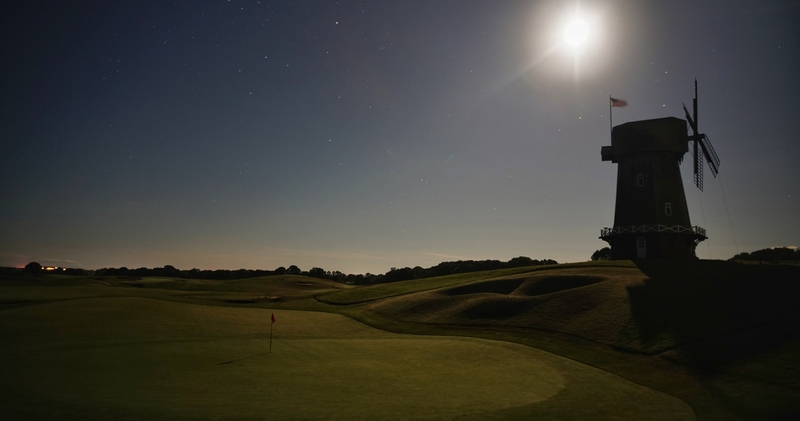 Simply put, this is one of the best openers in golf. 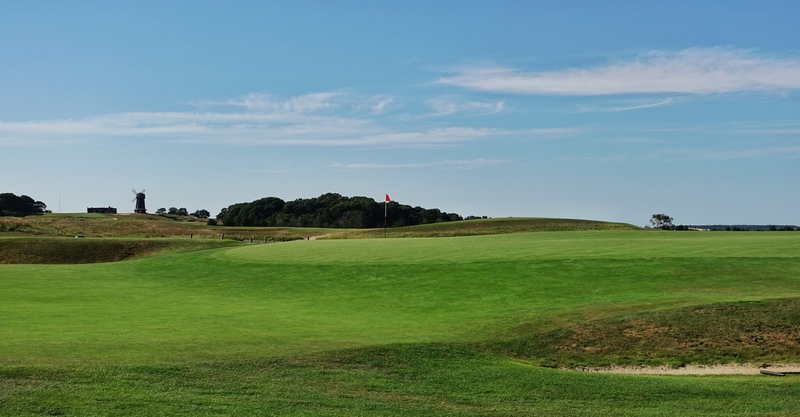 The third of three difficult holes, the 5th at National asks for a tee shot over a formidable cross bunker cut into the hill to a fairway humped down its spine so as to shed balls to either side. 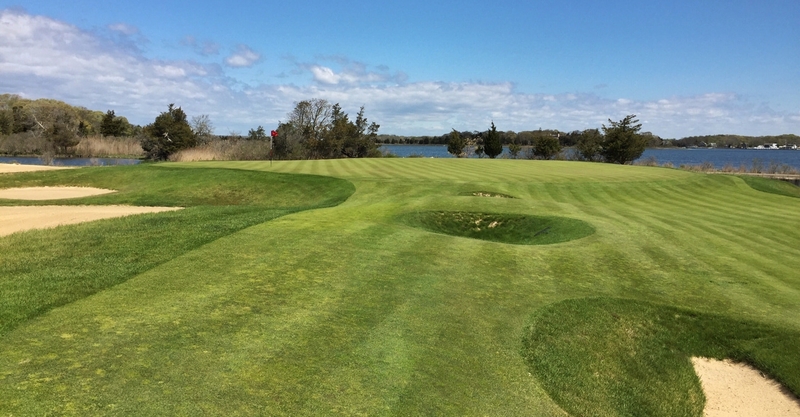 The fairway’s natural ripples provide added visual and playing interest. 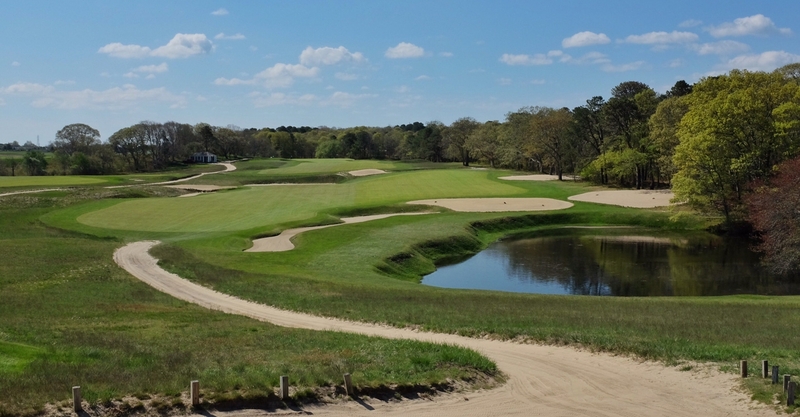 Longer drives will contend with a unique trench bunker that bisects the fairway. 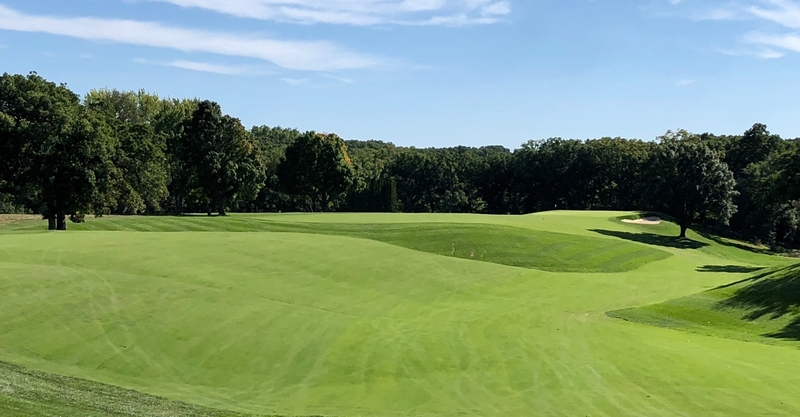 The wide, downsloping fairway leads straight into the green and will carry running approach shots a long way, allowing even shorter hitters to reach this long par-4 in two shots. 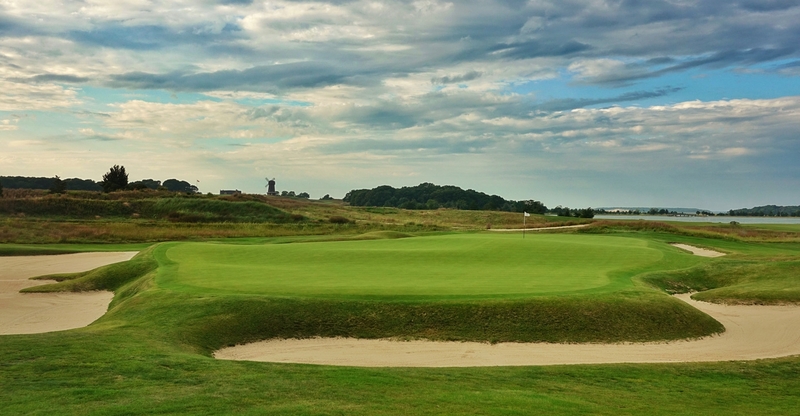 Two bunkers left of the green strongly suggest that the player use the sloping right-to-left fairway to access the green. 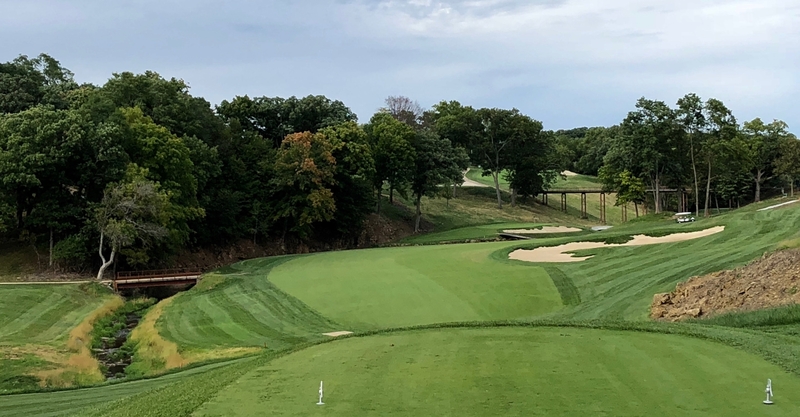 The diminutive sixth might be the shortest hole at National, but with one of the largest and wildest greens on the property, it is as fun as it is maddening. 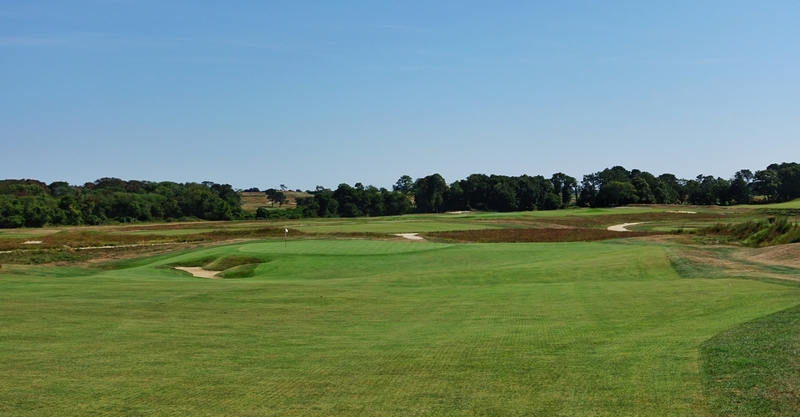 From the tee, the greens for Sebonac and Eden are visible to the right. 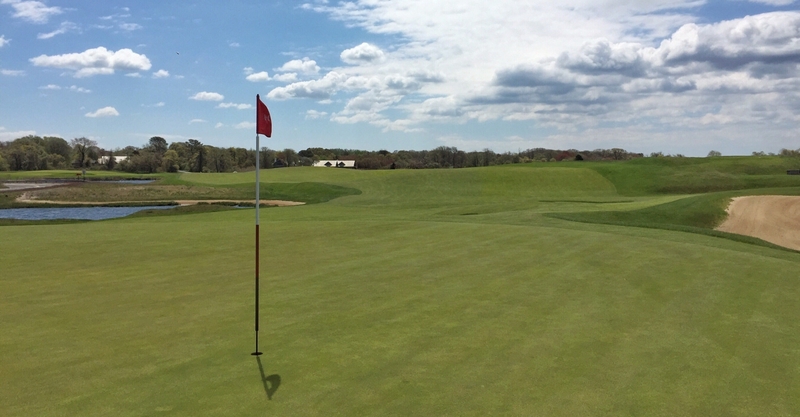 To say this putting surface on this Short template is heavily contoured is to understate the matter substantially. 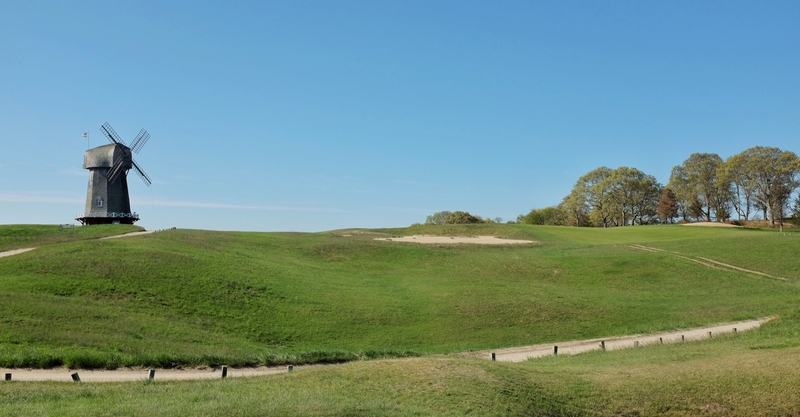 The large mound in the center sheds balls in all directions, as does the larger green itself. 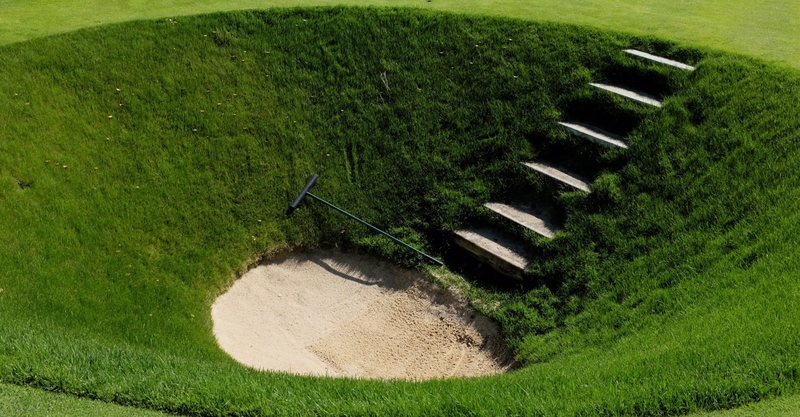 Any ball that fails to find (or hold) the green is likely to end up in a bunker – some more penal than others. 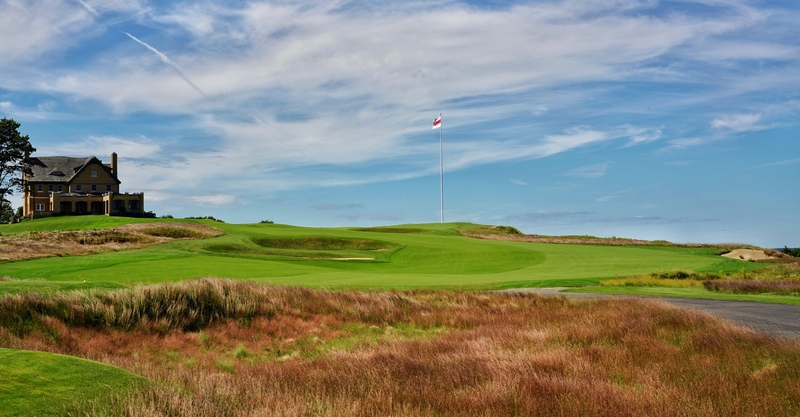 The first three shot hole at National is Macdonald’s tribute to the Road Hole at St. Andrews. 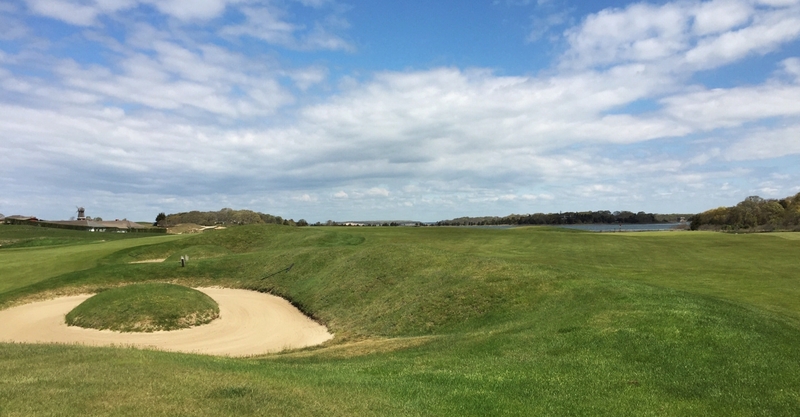 A blind tee shot over a waste area is the first order of business. 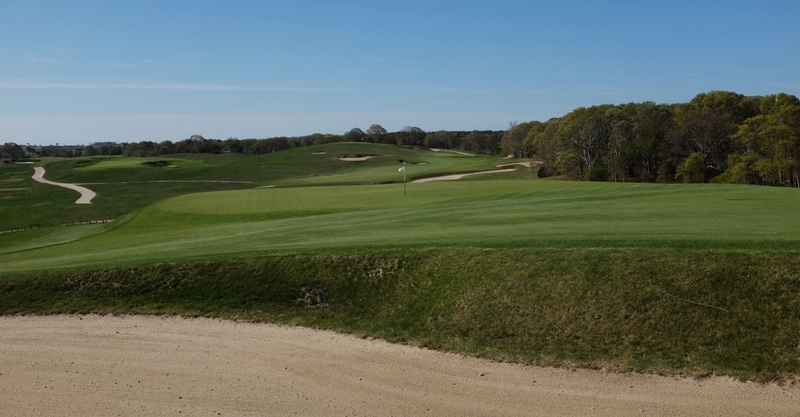 The bunkering down the right, which is largely invisible from the tee, will catch any shots that stray that way. 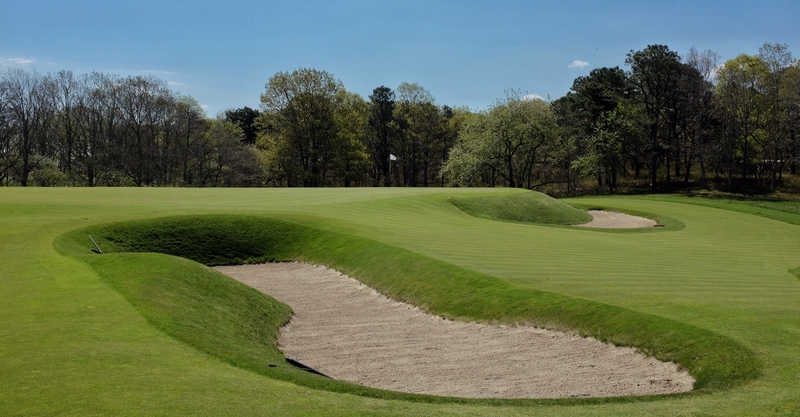 The National is replete with interesting and unique terrain features, like the slash of a bunker and fronting mound. 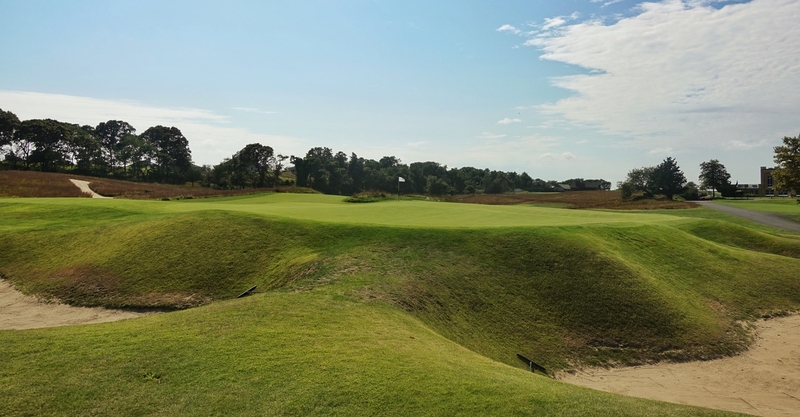 Two small bunkers in the area short of the green are so flat that they are invisible from a distance, adding to the uncertainty and challenge of the approach. 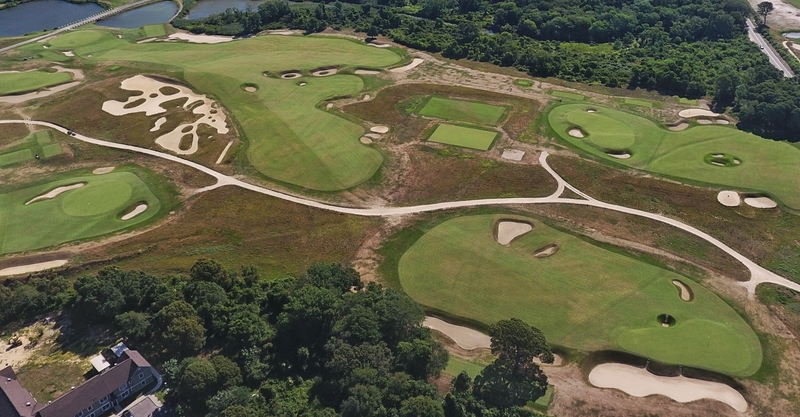 The road bunker looms to the left of the elevated and large green, adding exponentially to the difficulty of judging and hitting an approach shot. A brilliant feature. 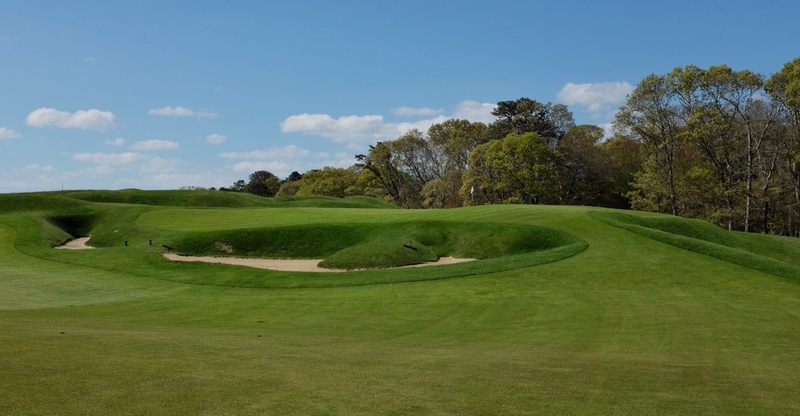 The most formidable Road Hole bunker that Macdonald ever created, this monster has allegedly been softened over time. 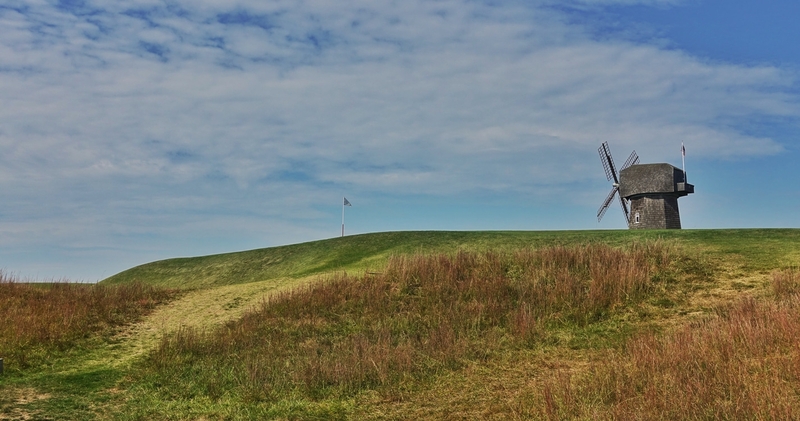 The green, while largely flat, slopes away on all sides and is harder to hold than it appears. 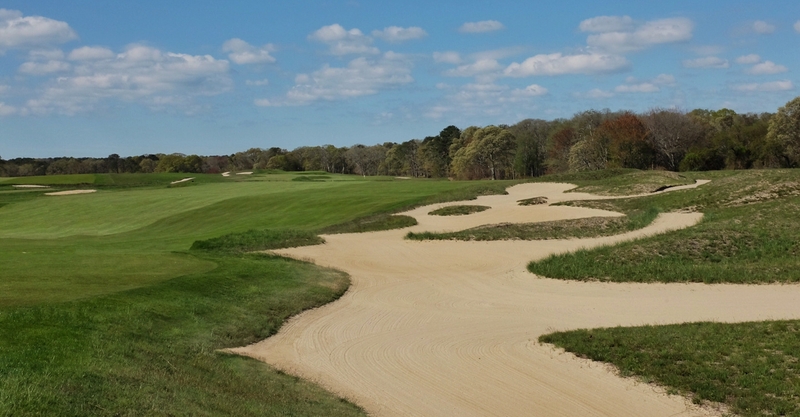 A large, deep bunker runs down the entire right side of the green, ready to catch those who decline to challenge the Road bunker. 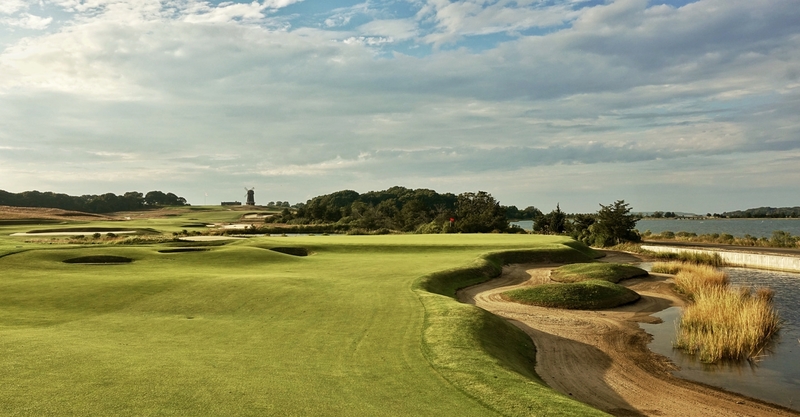 An exceptional three-shot hole in every respect. 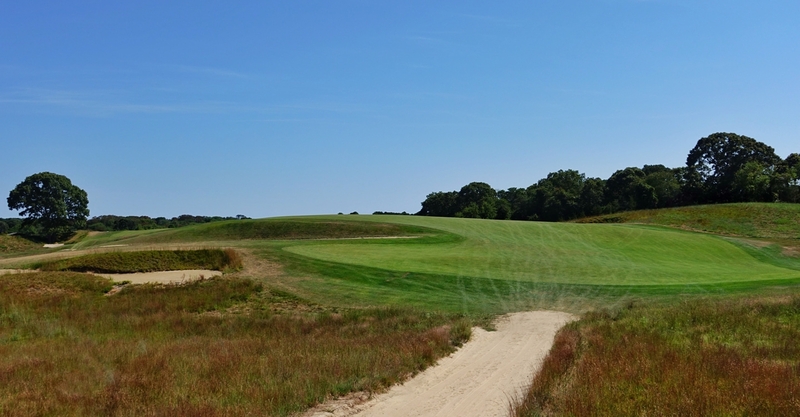 Another template that has been largely lost with time, Macdonald’s “Bottle” hole presents the options while playing over Shrubland Road. 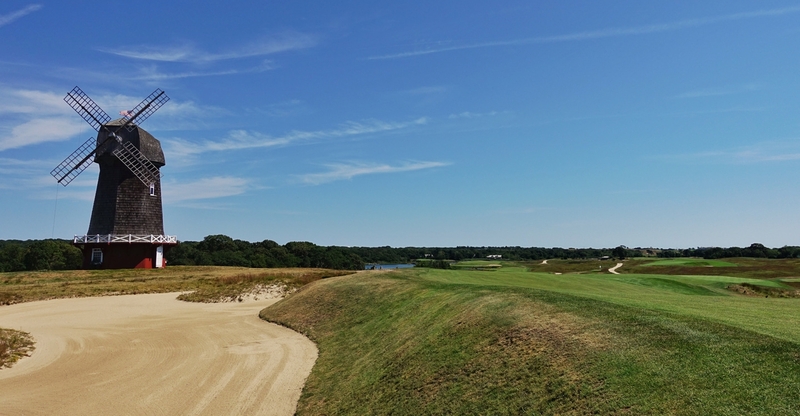 Take the straightforward tee shot down the right side, or attack the left side of the fairway and challenge the bunkers in return for a better view and angle into the green. 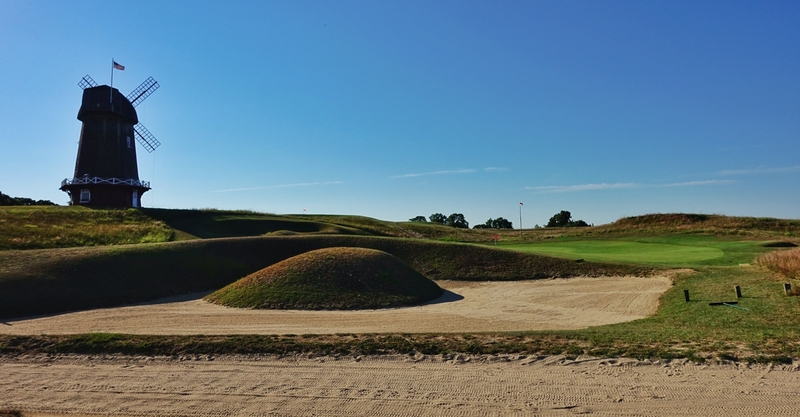 The Bottle bunkers that bisect the 8th are unique in design and formidable in their defense of the hole and they play bigger than they look. 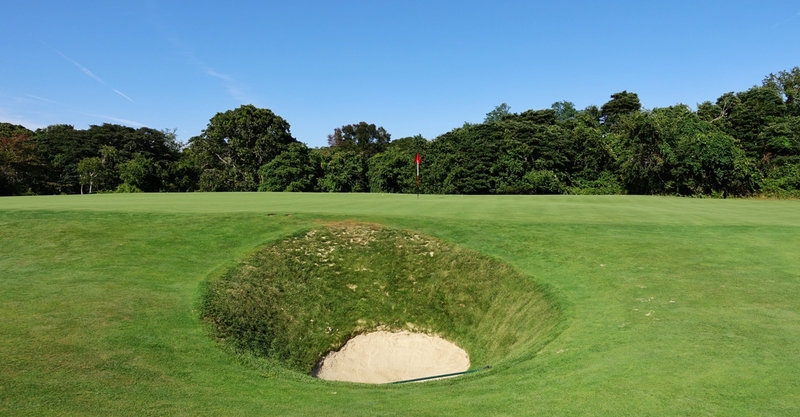 Between the Bottle bunkers and the green, Macdonald installed a Principal’s Nose bunker complex. The green is substantially elevated with steep drops on three sides, and missing right is particularly penal. 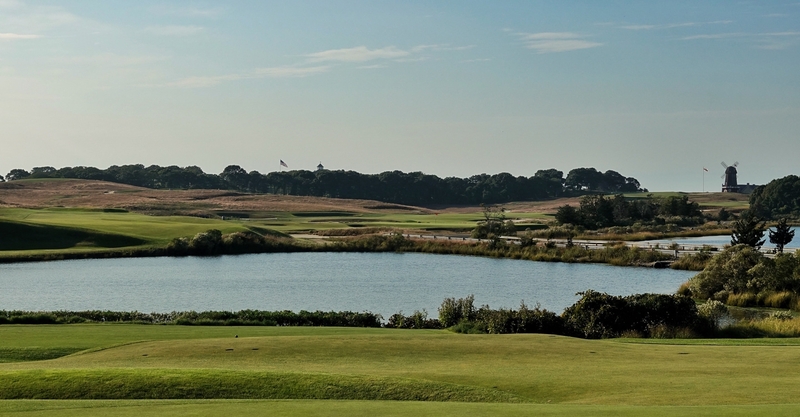 The aptly named ninth is the longest hole at the National, which is perhaps surprising to some, since it measures only 540 yards. But what this hole lacks in length, it more than makes up for in other ways. 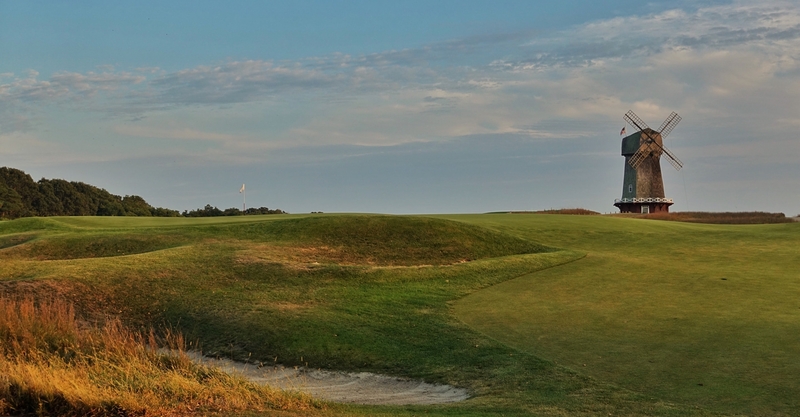 The ideal line off the tee is to remain as far right as possible while still carrying the short set of bunkers. 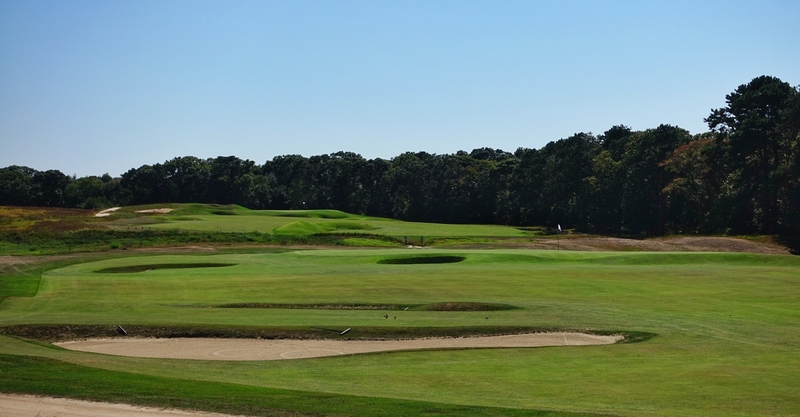 Shots hit down the left will run through the fairway and feed into the “Hell’s Half Acre” complex. 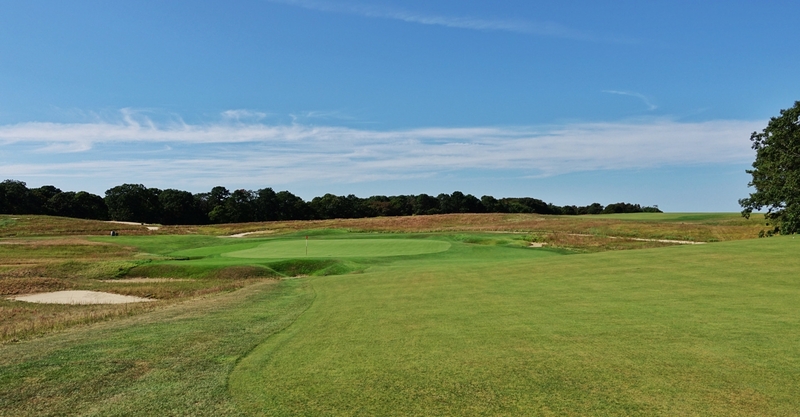 Once past Hell’s Half Acre, a large green defended by steep bunkers short left and long right awaits. 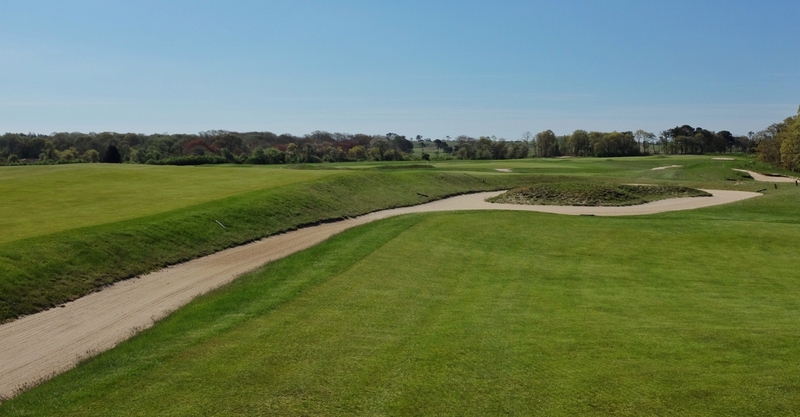 Certain pins will force the player to challenge the right bunkers and the side slope of the green, which will shed balls up to 25 yards away. 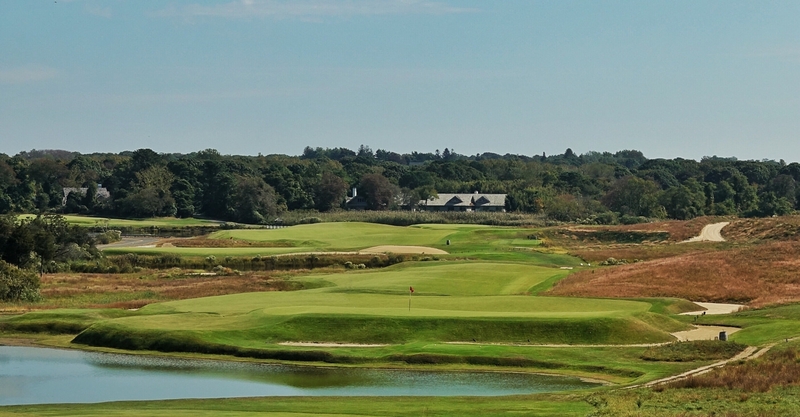 The 10th at National, drawing its name from its neighbor, borders Shinnecock Hills and turns the player back northward toward the clubhouse. 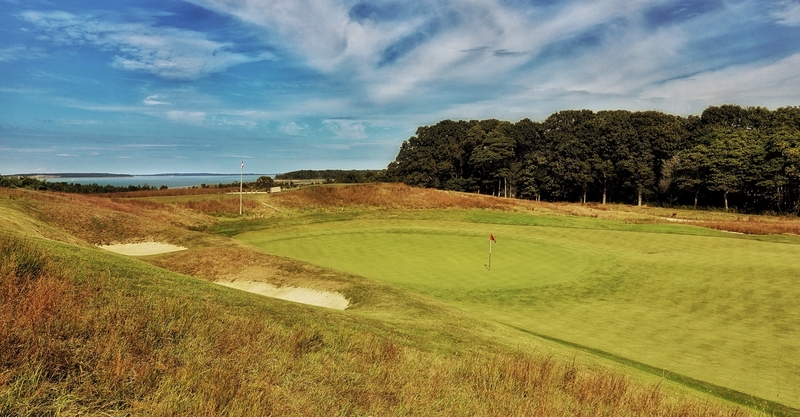 It is a hole that ranks as a favorite among many. 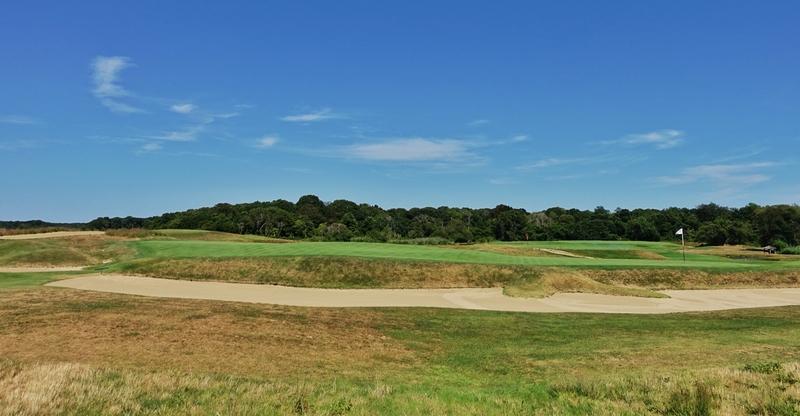 Two low profile cross bunkers encroaching into the fairway from either side add challenge to the tee shot. 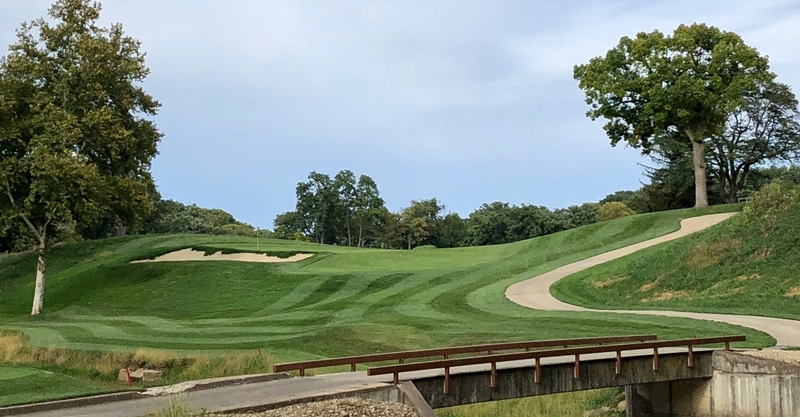 What looks like a rather straightforward approach shot from the safer, right side of the fairway is soon revealed to be more challenging than it first appears. 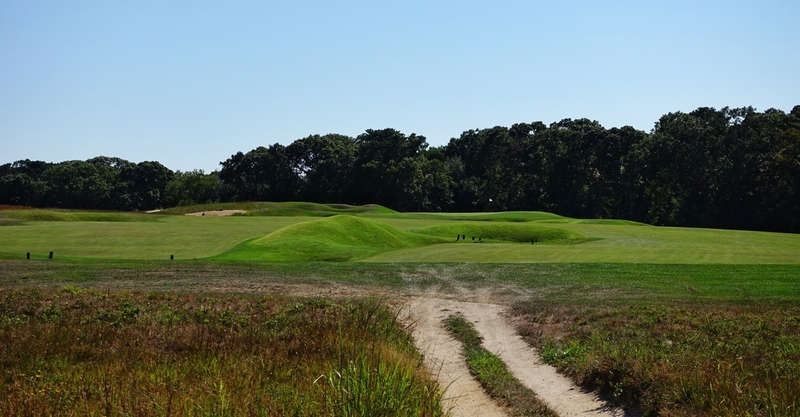 Again, Macdonald maps the terrain to allow approaches to the green along safer, if at times less rewarding routes. 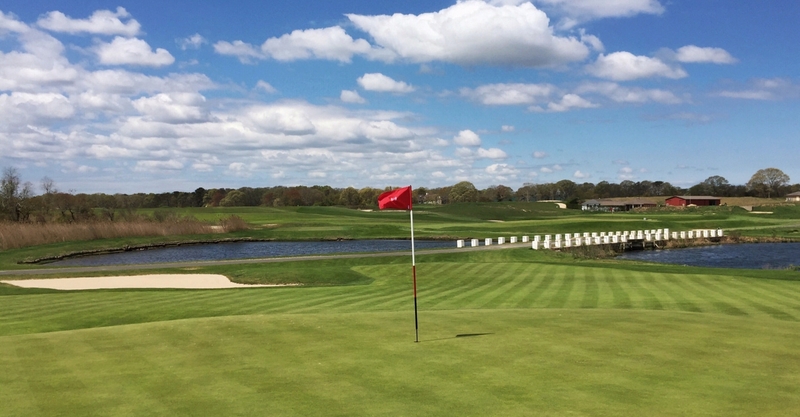 Here, if the proper angles are played, no hazards need be crossed. 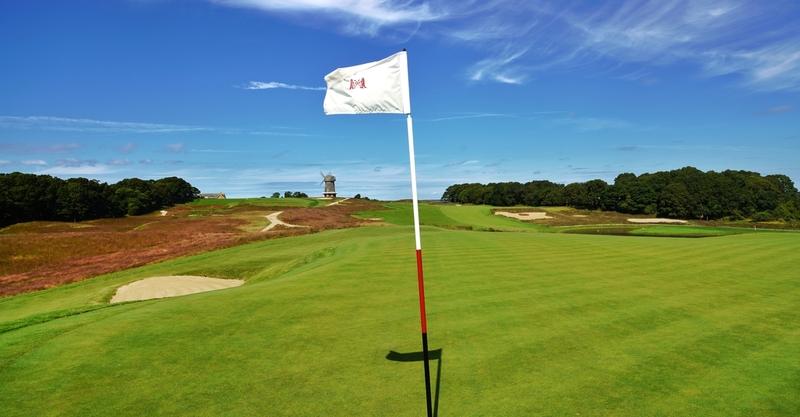 Shinnecock is punctuated by a wonderful green complex, to be sure. 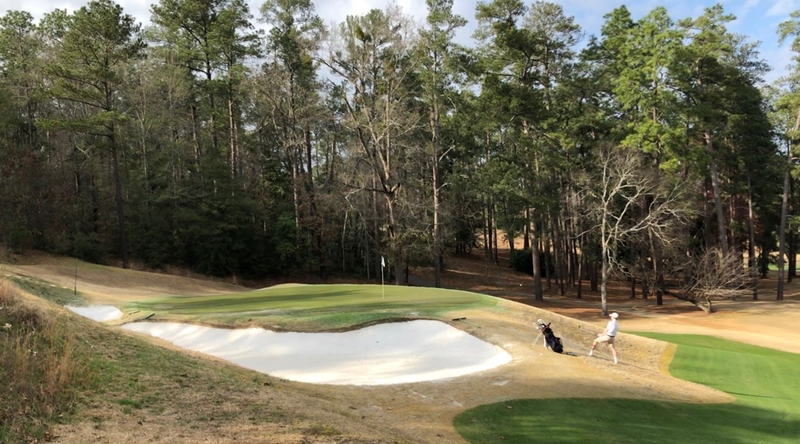 A blind tee shot awaits the golfer at the eleventh hole, and care should be taken to avoid the left side as gathering bunkers collect shots hit in this area. The approach on eleven crosses back over the road, obscured here by a berm. 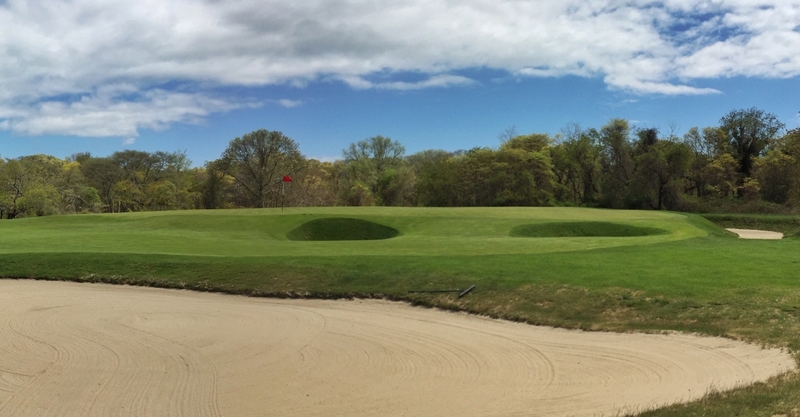 A second Principal’s Nose bunker complex sits short of the green. Macdonald’s exceptional Double Plateau green speaks for itself, with bold front left and back right sections set at an angle and divided by a deep trough. 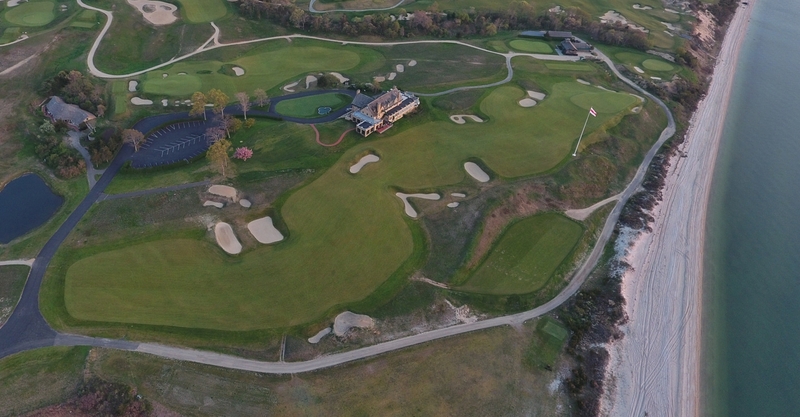 The small bunkers arrayed around this green have a much larger footprint than their actual size. It’s very possible to putt into some of them. 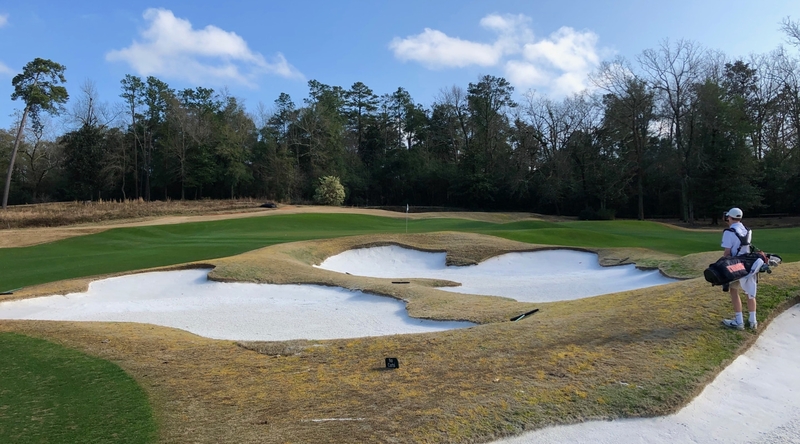 The large bunker behind guards the lower portion of the green and will catch balls that skirt through the middle of the plateaus. 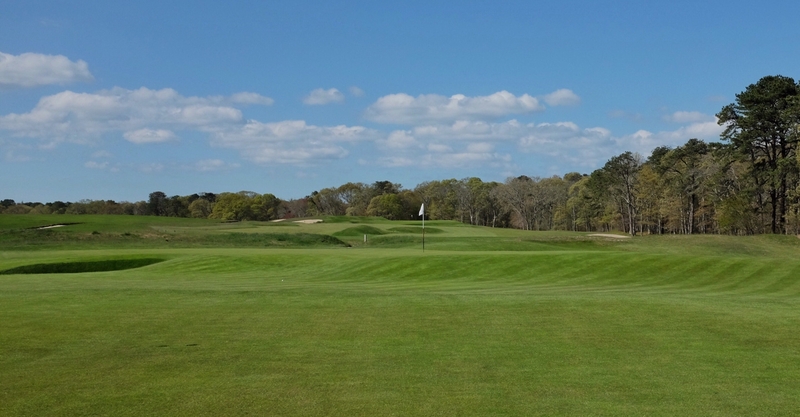 This two-shotter calls for a tee shot to an ample but angled fairway guarded by deep bunkers down the left side. 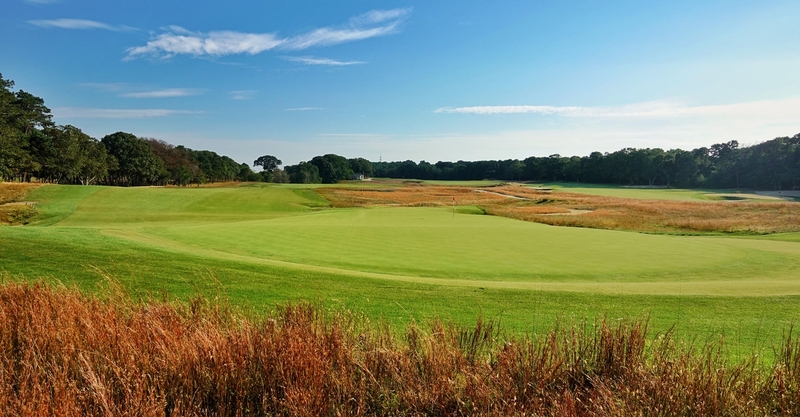 Approach shots confront a small, slightly elevated green fraught with hazards on all sides. 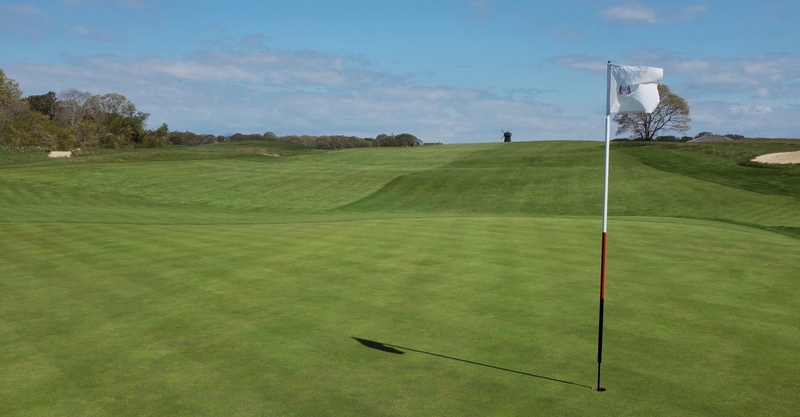 The lack of any background makes gauging distance difficult to a green that runs hard away to the right and rear. 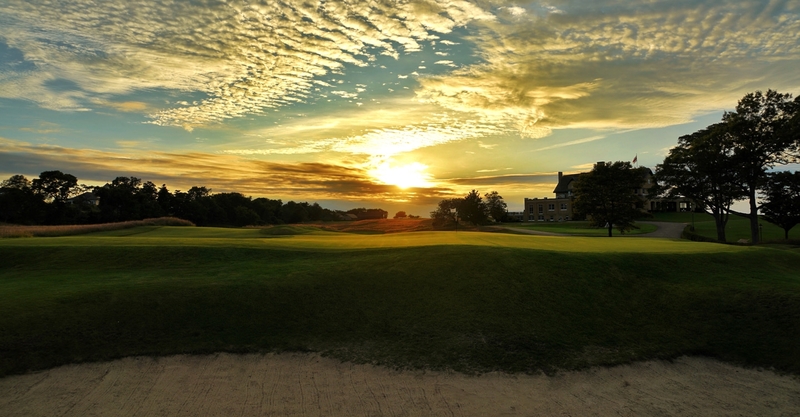 The third of the National’s three one-shot holes, Macdonald’s homage to the original at The Old Course at St. Andrews is fronted by the famous pond, which prevents players from having a go at the green with a putter. The result is a gorgeous hole. 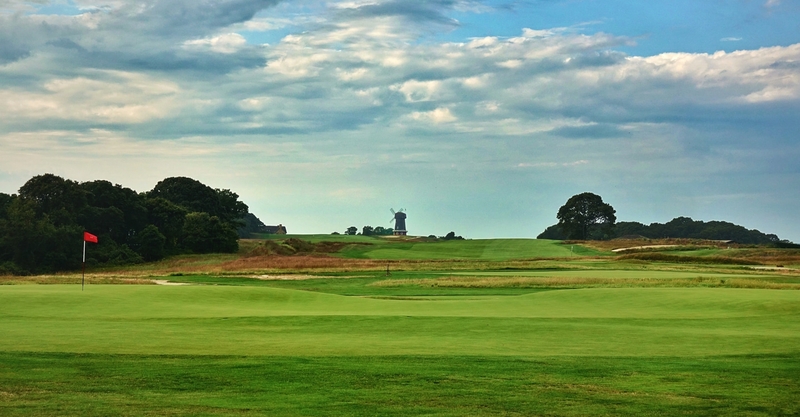 The Hill, Strath and Shelley bunkers are all present and accounted for, as is the namesake Eden bunker wrapping behind the green, which is particularly menacing. 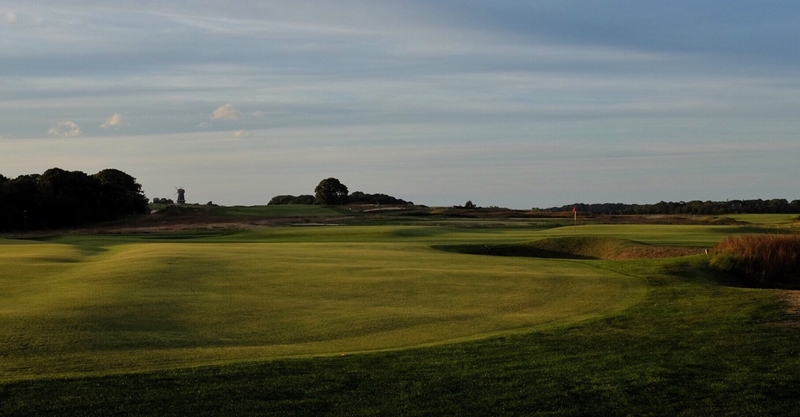 Tucked into a corner of the property, the Eden green is one of the most peaceful and beautiful spots in golf. 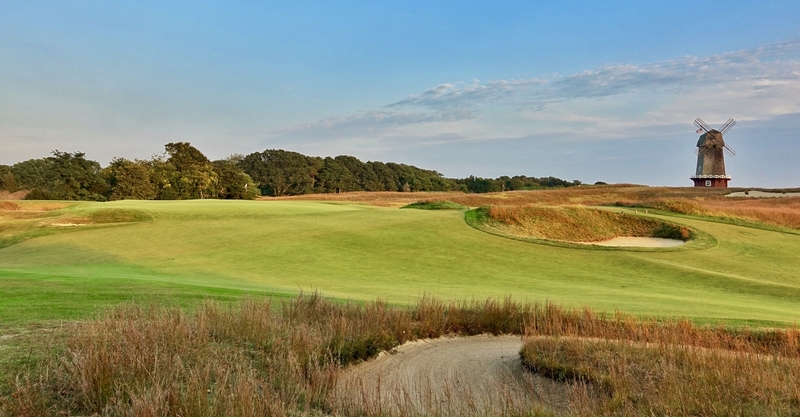 Perhaps the most beautiful hole at National, the fifteenth plays out to a fairway flanked with bunkers on all sides. 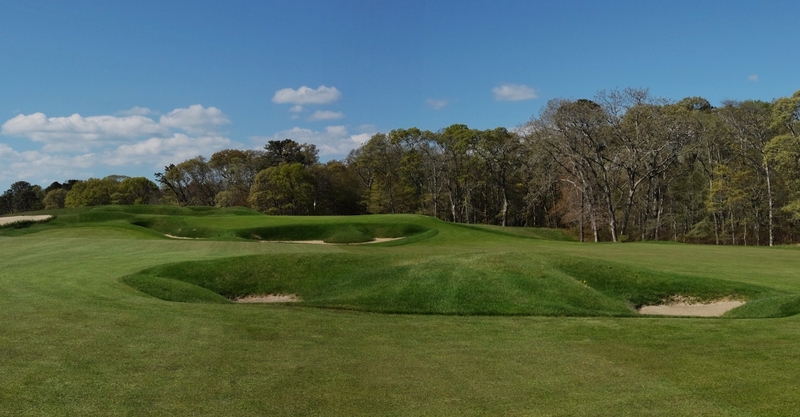 Missing the fairway into the left bunkers cut into the hillside all but guarantees a missed green. 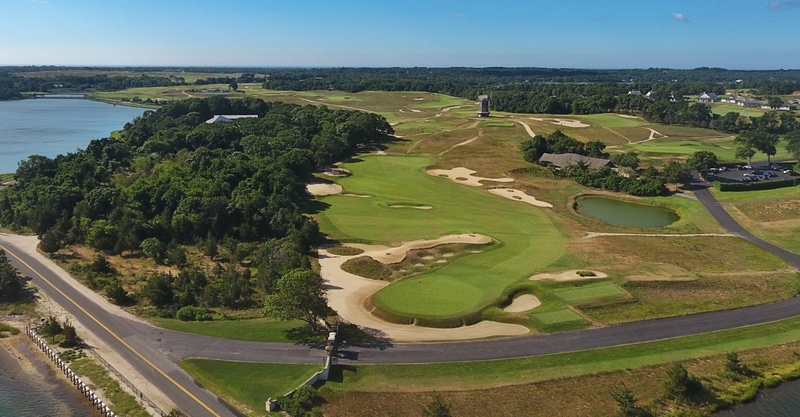 Macdonald’s strategic bunkering including one in the middle of the fairway some 60 yards short of the green, which is offset slightly to the left and is well guarded. 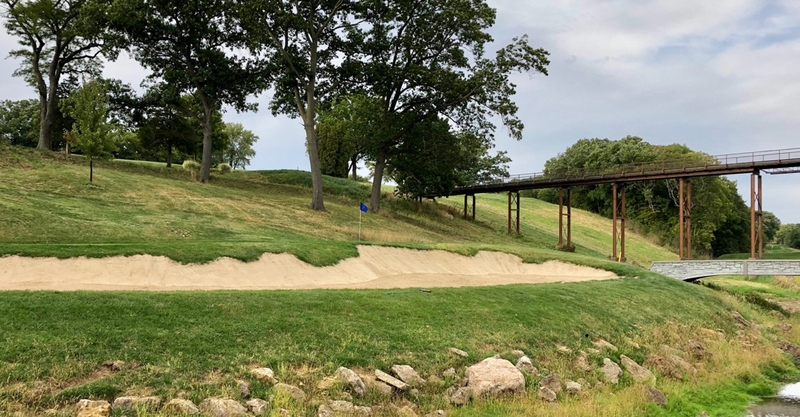 This is the most heavily bunkered hole at National. 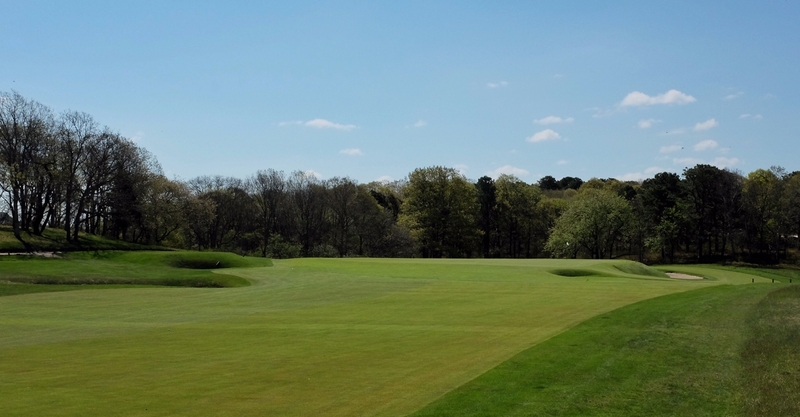 The green slopes substantially from back to front, aiding with approaches but making putting difficult. 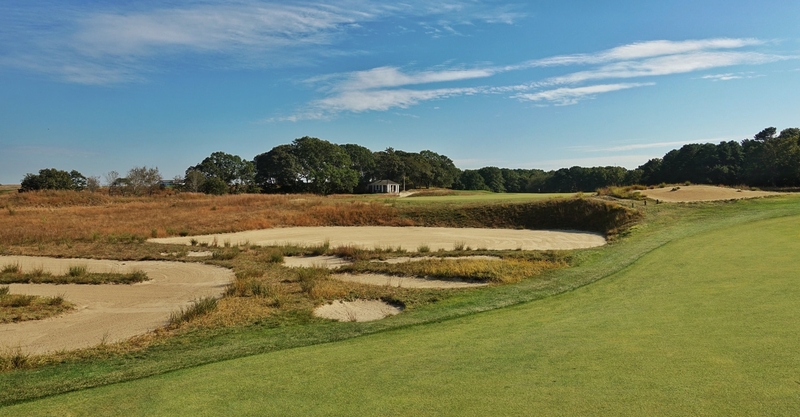 Long is a brutal miss here, as the player must not only confront the deep bunker, but the slope of the green running away. Once again, Macdonald gave the player no close background for reference, and the horizon look only adds to the challenge. An Alps/Punchbowl – this surely must be heaven. 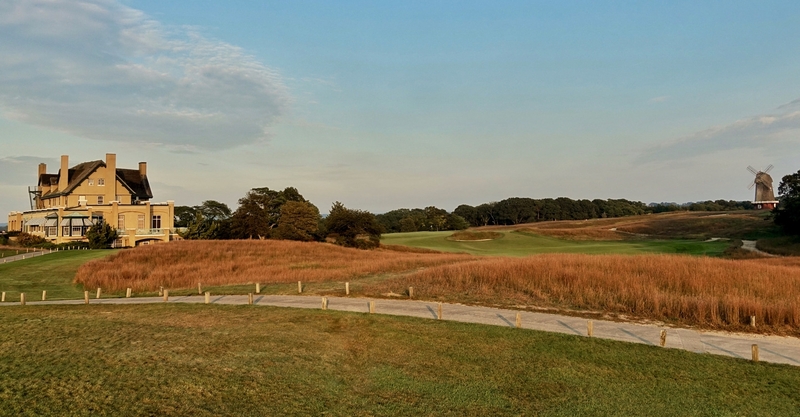 The 16th hole begins with a tee shot up a rising fairway, ideally reaching the level portion of the ground beyond the first crest. 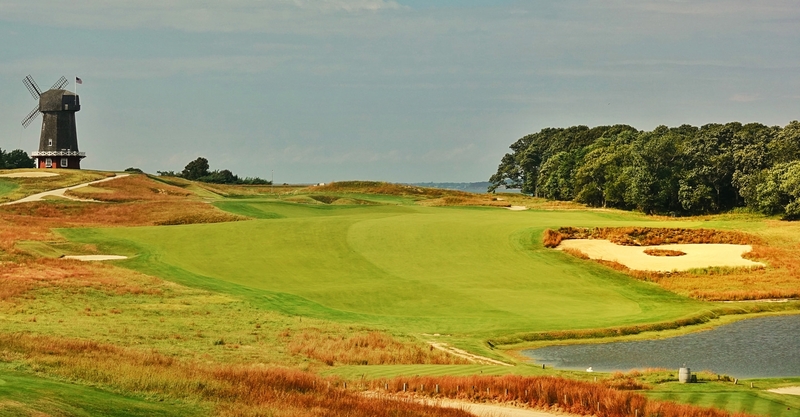 Straying too far to the right, however, will lead a ball to a deep hollow, similar to the feature on the second hole. 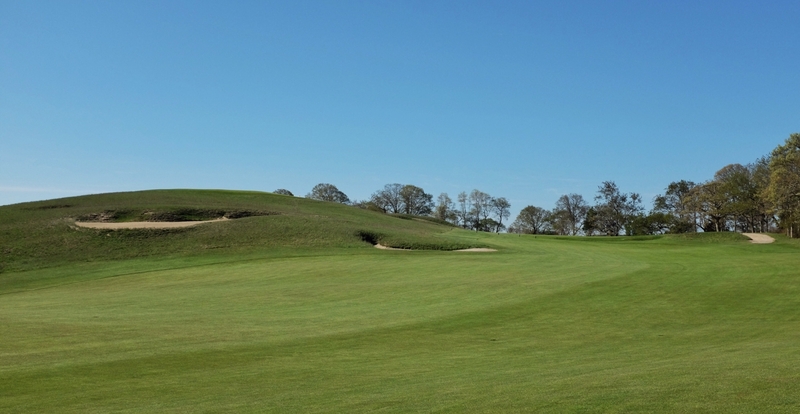 While all shots into the sixteenth green are blind and uphill, an approach from the bottom of the hollow is doubly so. 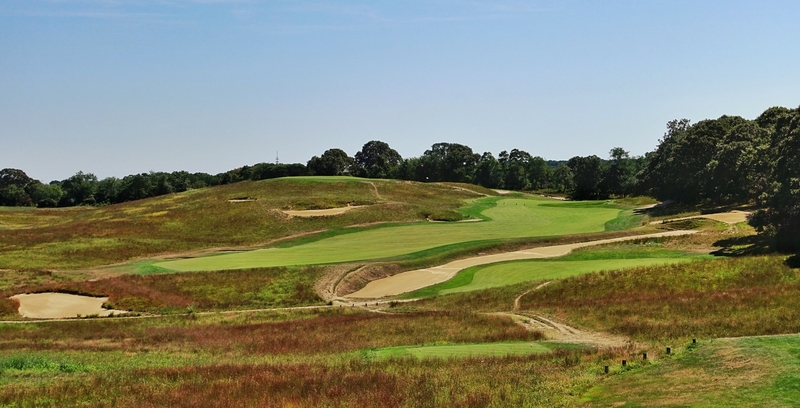 It also shares a Sahara-like bunker feature with the second hole, visible from short of the green. 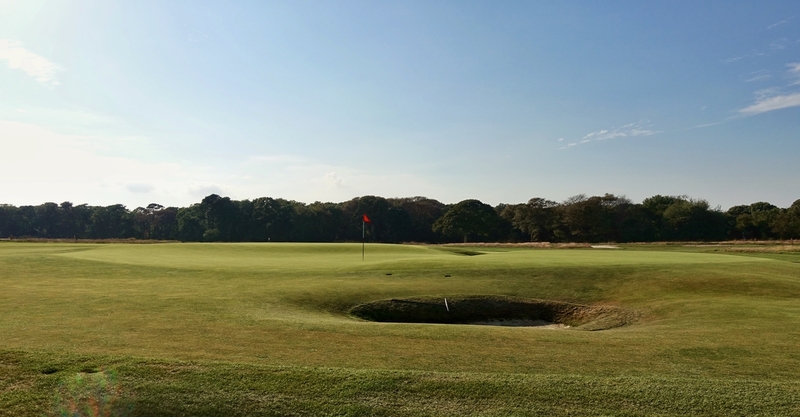 The putting surface itself is tiny, although the surrounding punchbowl features contain shots that miss. 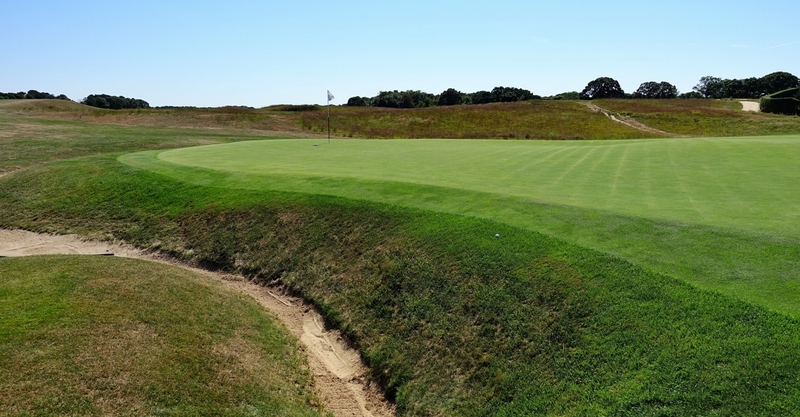 Having cleared the fronting bunkers, the player must still contend with the ridge running from the back of the hazard to the front of the green, which will deflect balls in random directions. 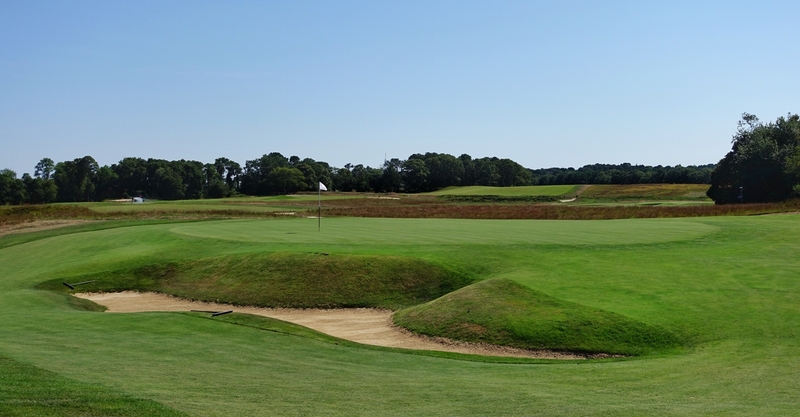 Two bunkers set high into the face of the left hill provide a formidable hazard for shots that are far enough offline to deserve such a fate. 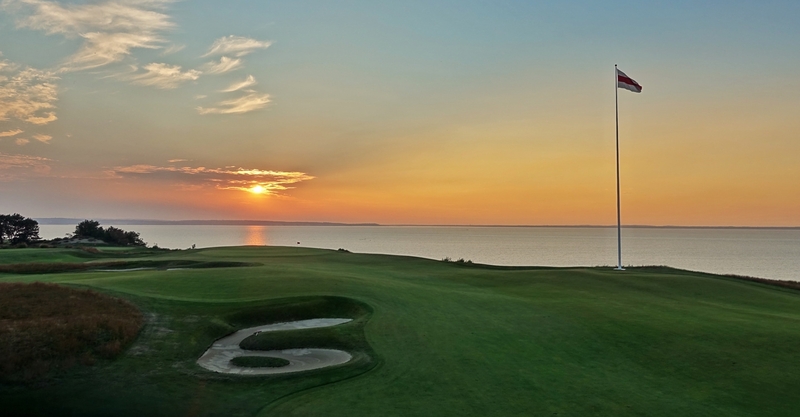 An incomparable hole. Indeed. 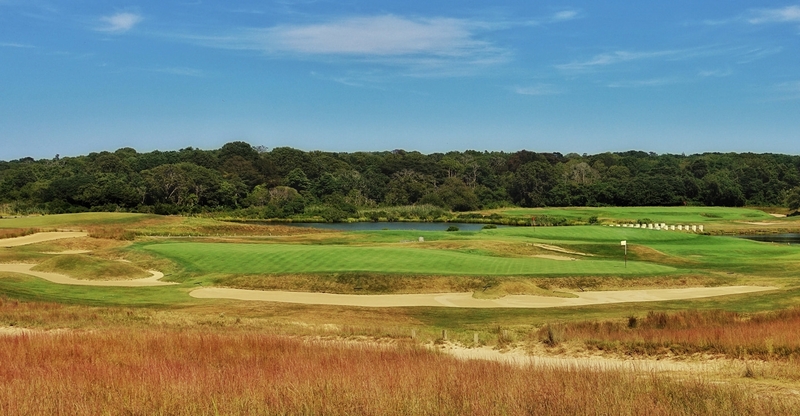 The penultimate hole at NGLA is a gorgeous in every respect, but it is also a world class short par-4 Leven template. 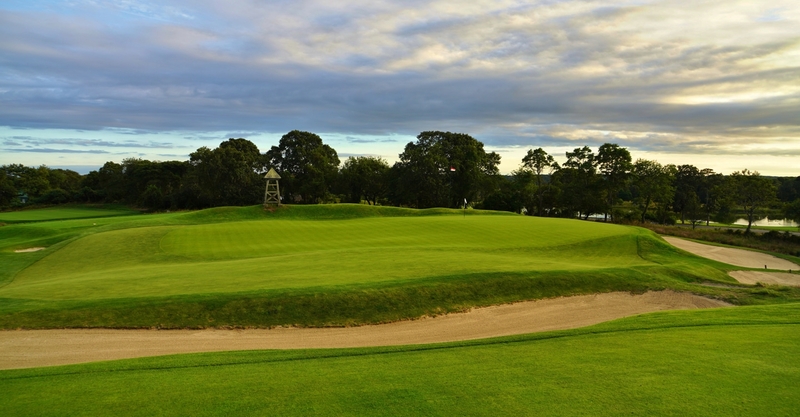 From the tee, the player is forced to lay up short of the two fairway bunkers or drive over them to the left. This hole is reachable for longer hitters. 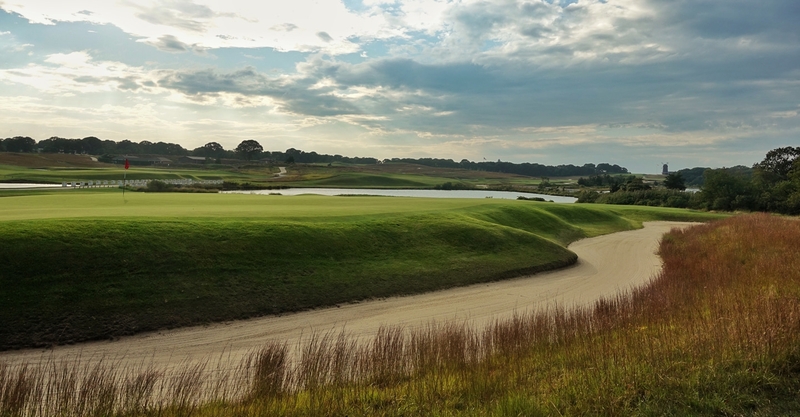 On approach from the right, the player confronts an odd sandy berm that runs the length of the green and hides parts of the putting surface. 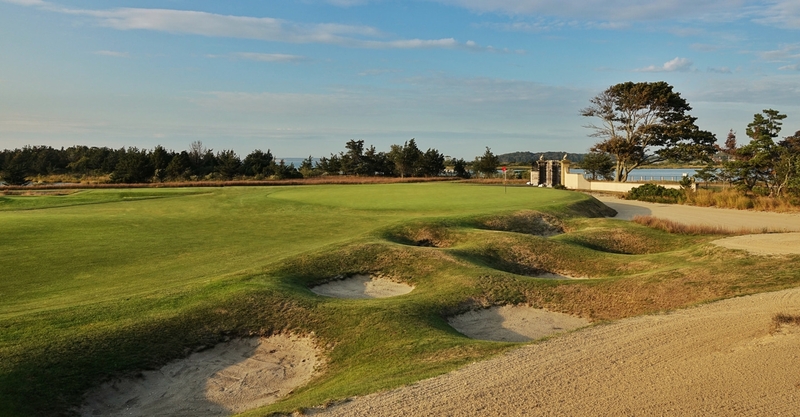 The berm also hides the small pot bunkers, which stand ready to catch any shot left short. This defense is a unique feature, and one that can’t be found elsewhere. 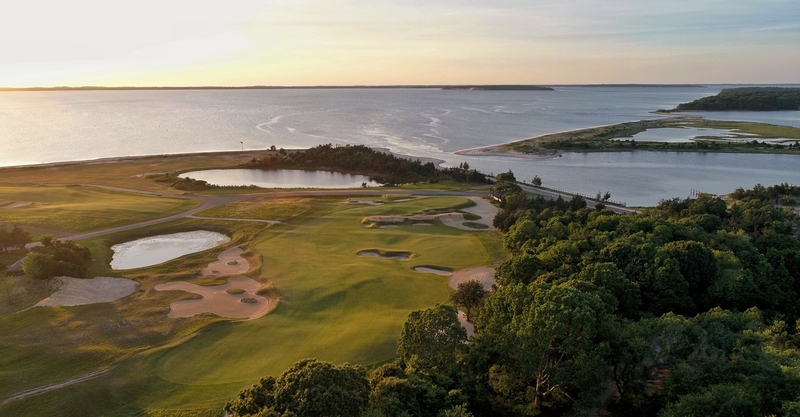 Playing far longer than its listed yardage, the three shot eighteenth hole plays back up to the clubhouse with full views of Peconic Bay. 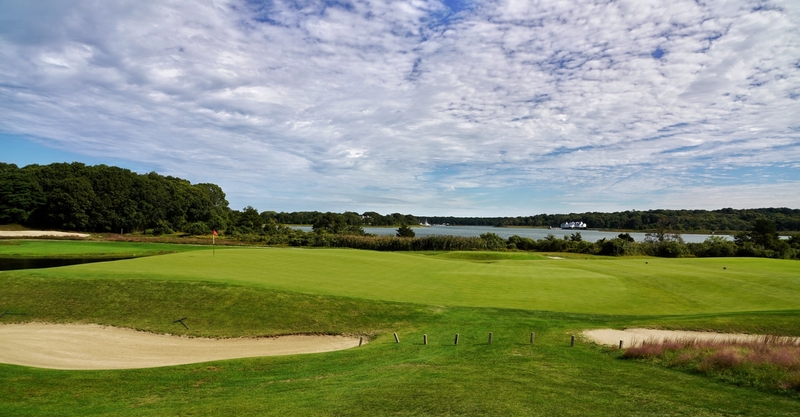 While headed up the home fairway, one appreciates what Bernard Darwin meant when he wrote of the beauty of golf along Peconic Bay. 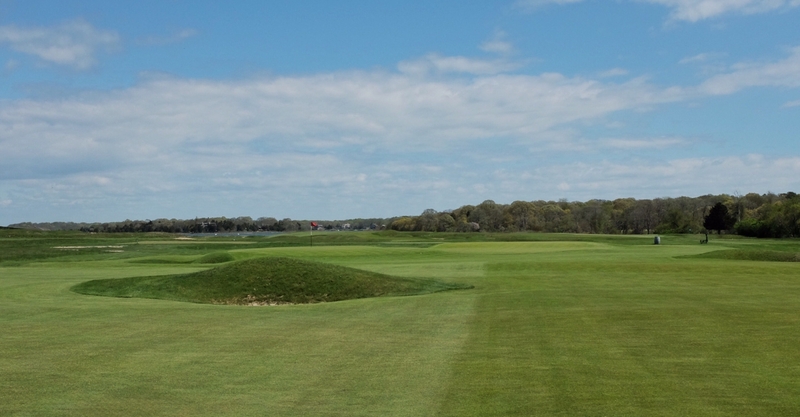 In approaching the green, the left side affords the better view, the right the better angle of play. 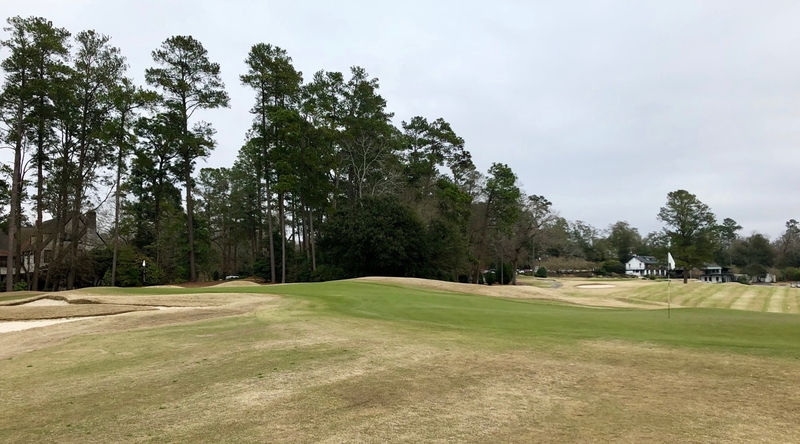 The green provides ample room for a ground approach but falls away rather steeply on all sides – long does not work well here. Cresting the hill and putting out, the first time player senses that the game will never be quite the same for them again. Charles Blair Macdonald had panache, but he was also a man of purpose. 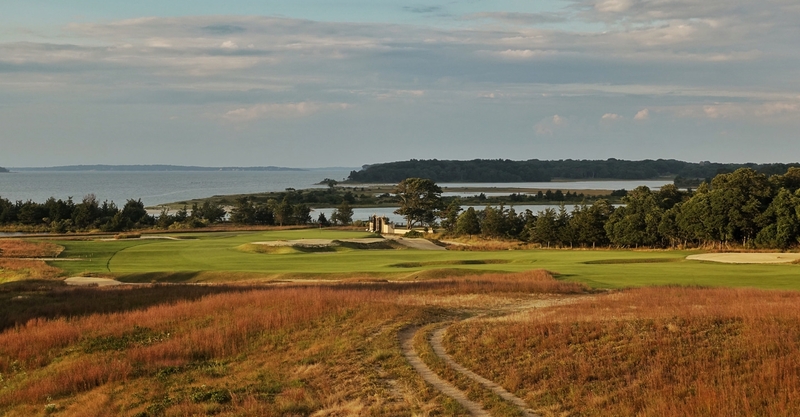 These two sides of his personality are reflected in the design of National Golf Links. Looking at the aerial and ground photographs, one can’t help but notice that there is quite a bit going on. 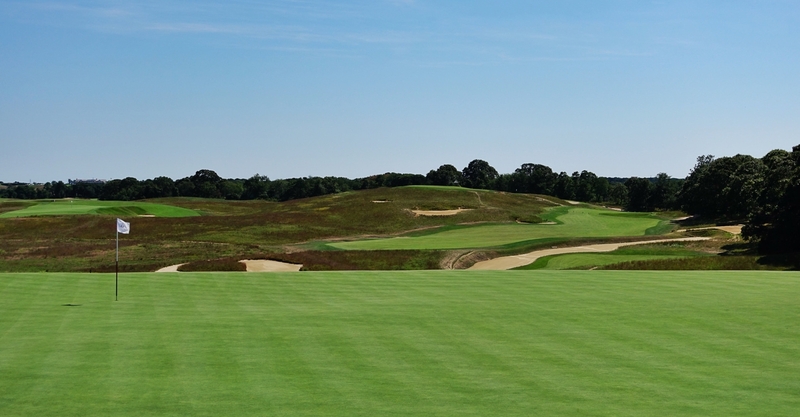 The experience of playing the course is similar. So much to see and take in. The wealth of artistic features should not be mistaken for mindless clutter though. 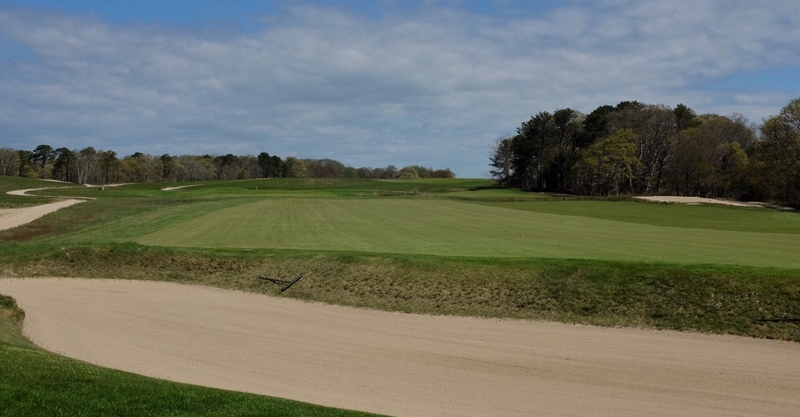 Every mound and bunker has a purpose, every contour a use. 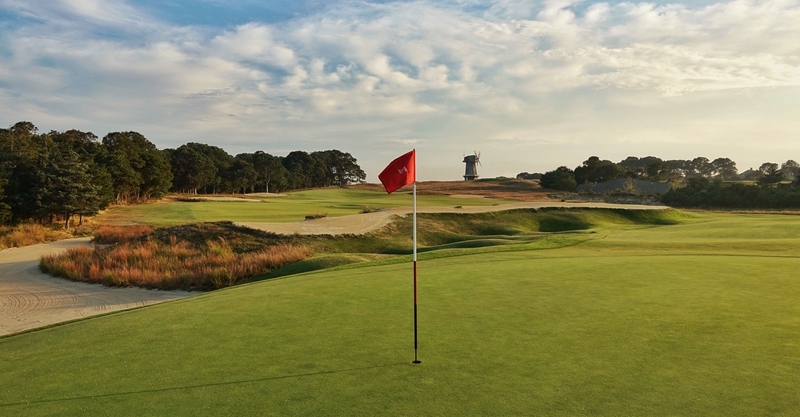 Taken together, these features combine to form holes that have asked players complex questions for more than a century. The answers do not come easily. Repeat play and careful study are required of those whose aim is to discover all of NGLA’s secrets. 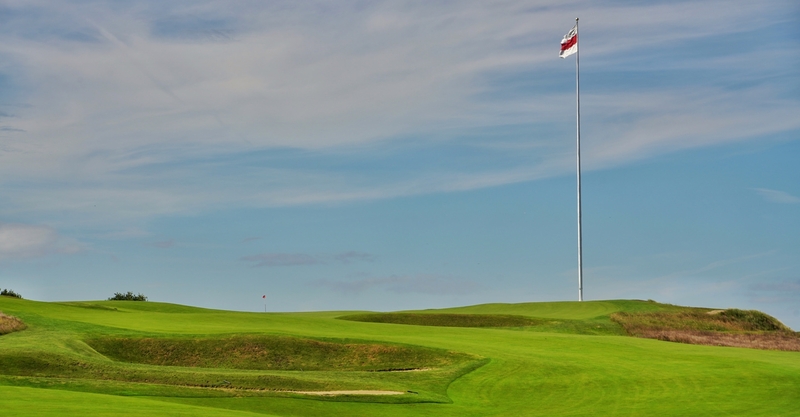 Macdonald was not an architect for hire at National Golf Links. This was his club. He was deeply invested in its success financially, intellectually and emotionally. 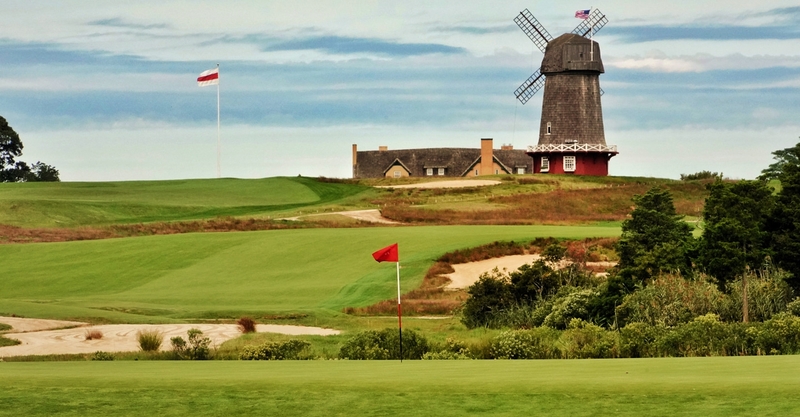 He was not just building the next in a long line of golf courses. He was creating a masterwork. That devotion showed in the product of his work in Darwin’s day, and its timelessness endures. For those wishing to dive even deeper into the history of the club, more knowledgeable men have already covered that ground. 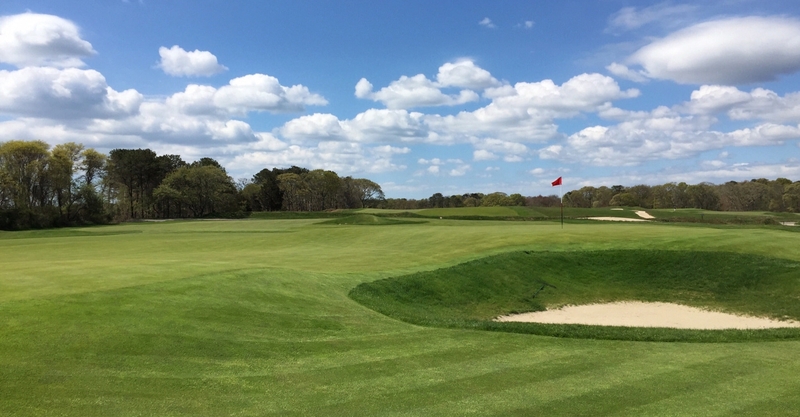 I cannot recommend highly enough George Bahto’s The Evangelist of Golf: The Story of Charles Blair Macdonald, Chris Millard’s NGLA club history book, and Macdonald’s own Scotland’s Gift: Golf. 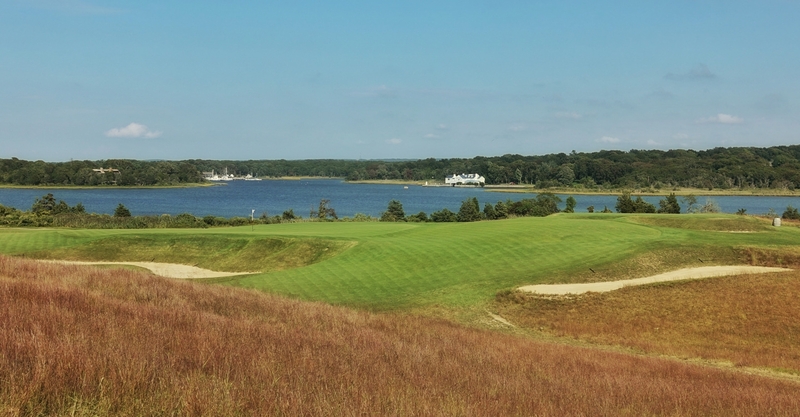 Categories: golf, golf course architecture, golf course tours, golf courses | Tags: cb macdonald, charles blair macdonald, geekedongolf, golf course, golf course architecture, golf course photography, golf course photos, golf course tours, jason way, jon cavalier, linksgems, National Golf Links of America, NGLA, seth raynor, simon haines, template holes | Permalink. 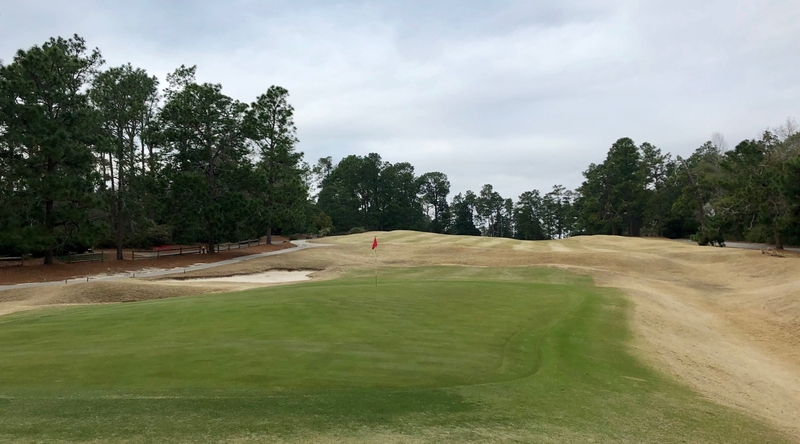 While listening to a podcast with Ron Whitten, long-time architecture editor with Golf Digest, I was struck by how similar his early experience of falling in love with the game’s playing fields was to my own. 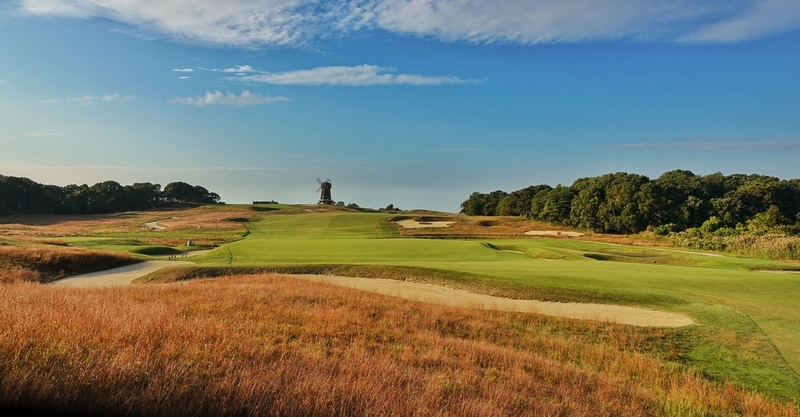 In his youth, Whitten visited both Canal Shores (then known by another name) and Chicago Golf Club. 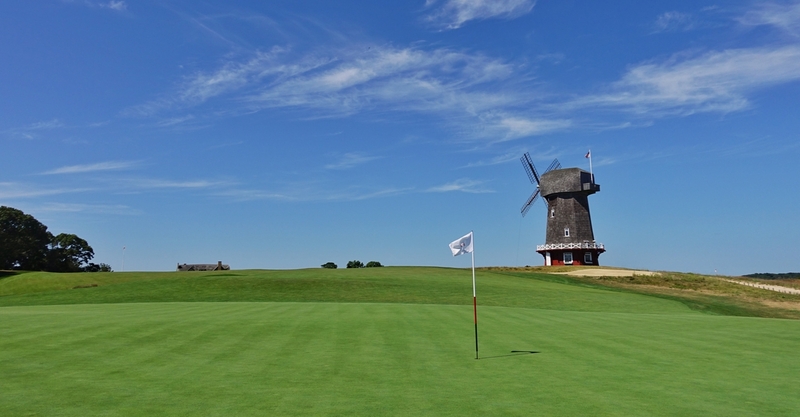 Each course delighted him in a different way, and caused in him a revelation that would launch his career – there exists a wondrous variety of golf courses to explore. Ron Whitten’s experience resonates with me because it mirrors my own, and that of my two sons. 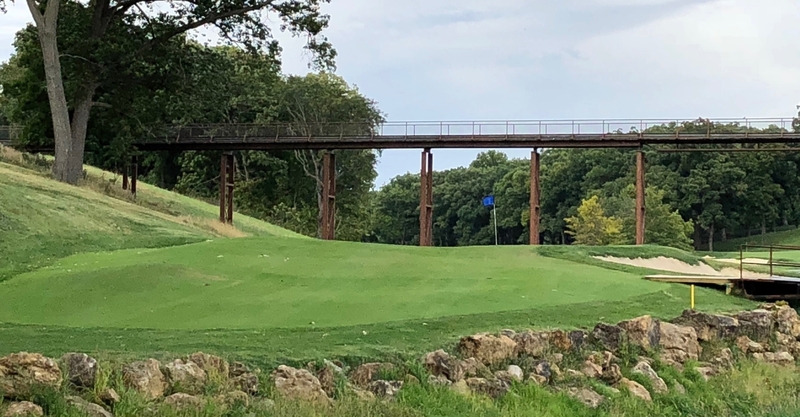 I learned the game playing with my dad and grandfather at the course on the old Fort Sheridan Army base in Highland Park, IL. 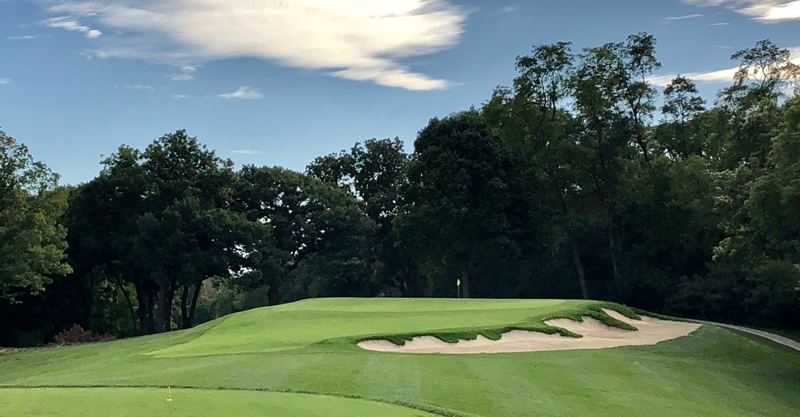 Soon after, I began a ten year stretch of caddying at the Old Elm Club, a Harry Colt design built by a young Donald Ross – a true architectural gem. 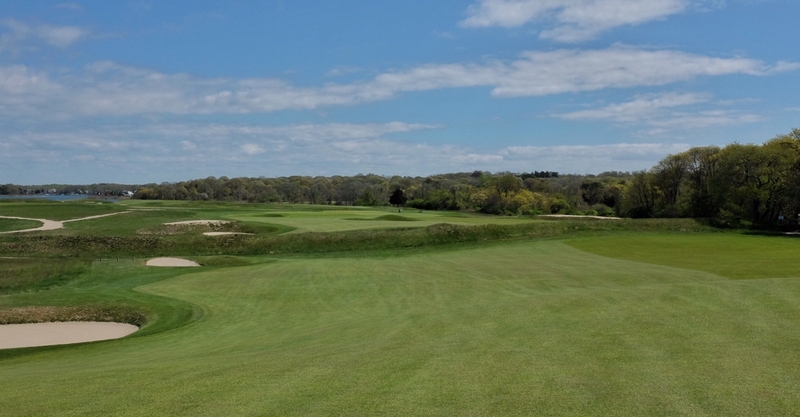 I played many other courses during my younger days, but Fort Sheridan and Old Elm were my favorites. For me, although they resided at completely different ends of the spectrum in terms of pedigree and conditioning, they were both intensely interesting in their own way. 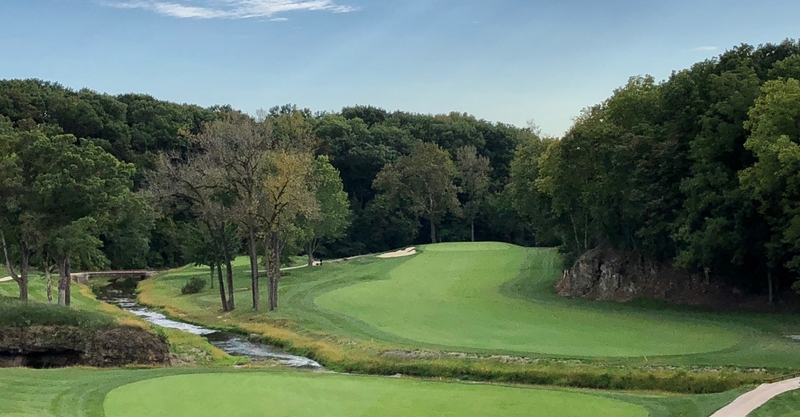 With the minds and hands of both Harry Colt and Donald Ross involved, the greatness of Old Elm is inherently obvious. 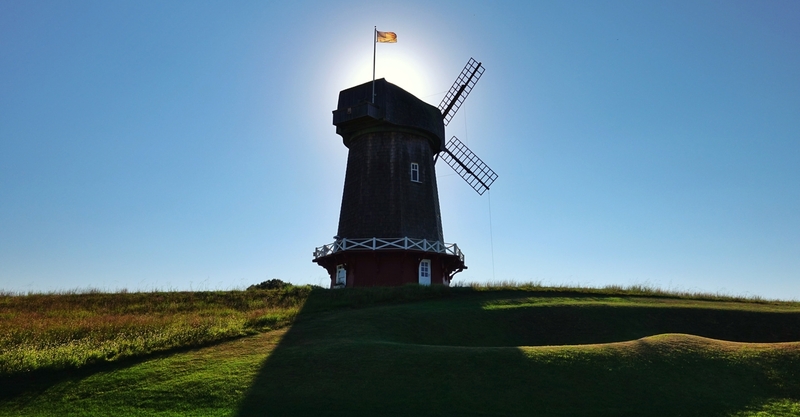 Fort Sheridan wound through a military base past tanks and cannons, on the parade grounds and over ravines – what could be cooler for a little boy? Fast forward and I now split time with my sons between Canal Shores and Kingsley Club, each interesting in its own unique way. 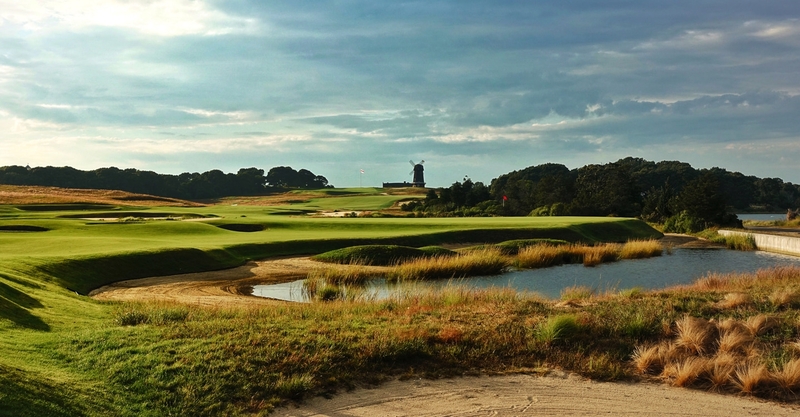 The subject of what defines greatness in golf course architecture is one that I covered previously in my 108 in 48 post. There is a broader category of “good” into which great courses like those fall, with a much simpler definition informed by my experience. 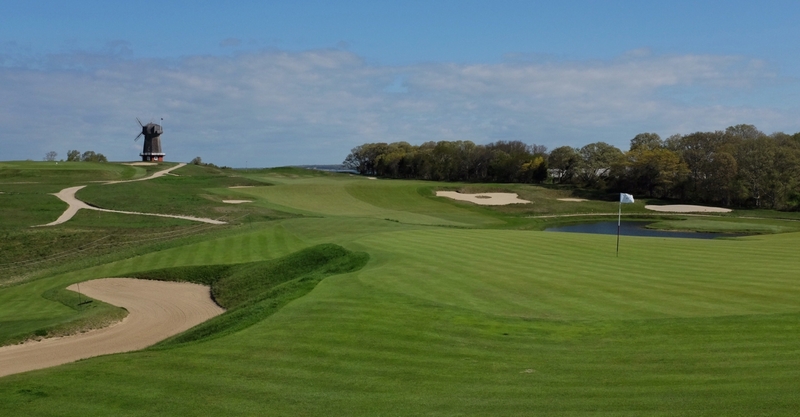 A good course is one that is interesting enough to make me want to play it again. This definition is inclusive of both ends of the spectrum, and tends to be exclusive of courses in the middle. 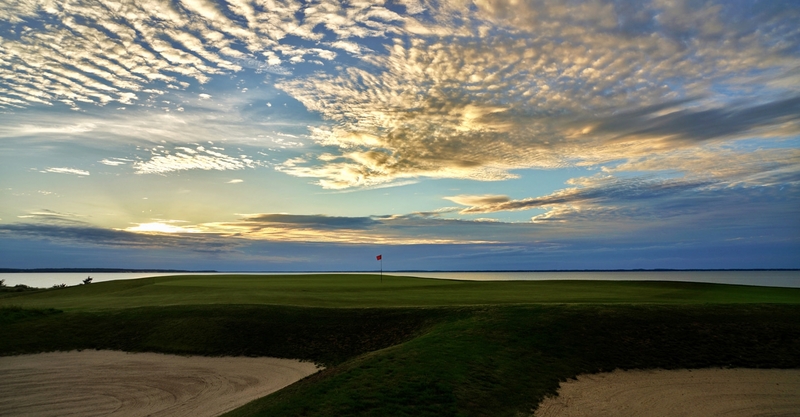 Life is too short to spend precious golf time (and dollars) on the bland, the boring, or the just plain bad. I would rather hold out for those courses that get my gears turning with quirk, interesting details, or unique surroundings. 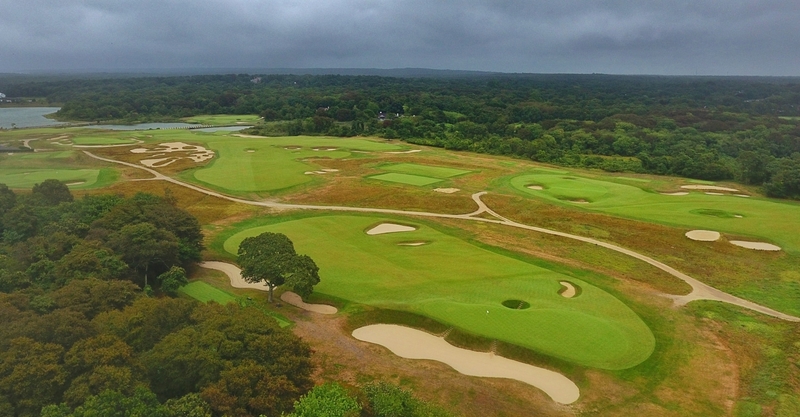 Exploring the ends of the spectrum and sharing those stories will be the focus of Geeked On Golf going forward. Chime in and share your experiences. It is always a pleasure to connect with kindred spirits. 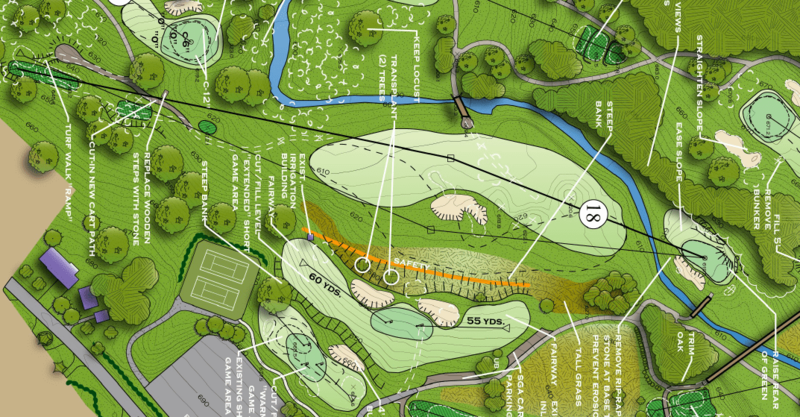 Categories: canal shores, community golf, golf course architecture, golf courses | Tags: andy johnson, geekedongolf, golf course architecture, golf courses, jason way, the fried egg | Permalink.